A model plane enthusiast and his 54-year-old wife have been revealed as the suspects arrested over the Gatwick Airport drone mayhem – but his boss claims he was working and could not have been the culprit. Forensic squads have been searching the home of window-fitter Paul Gait, 47, and his wife Elaine Kirk home but the probe was thrown into confusion as Mr Gait’s boss John Allard vouched for him and said he was at work. Mr Allard, who runs a double glazing firm in Crowborough, said he could ‘account for Paul’s movements between the hours of 7am and 5pm last Monday to Friday’. The 47-year-old suspect had been ‘part of a three-man team fitting glass doors and windows in the Crowborough area’, his employer said. Speaking to the Telegraph, Mr Allard added: ‘He is a reliable family man who has been with me for 17 years and has never given me any problems at all. 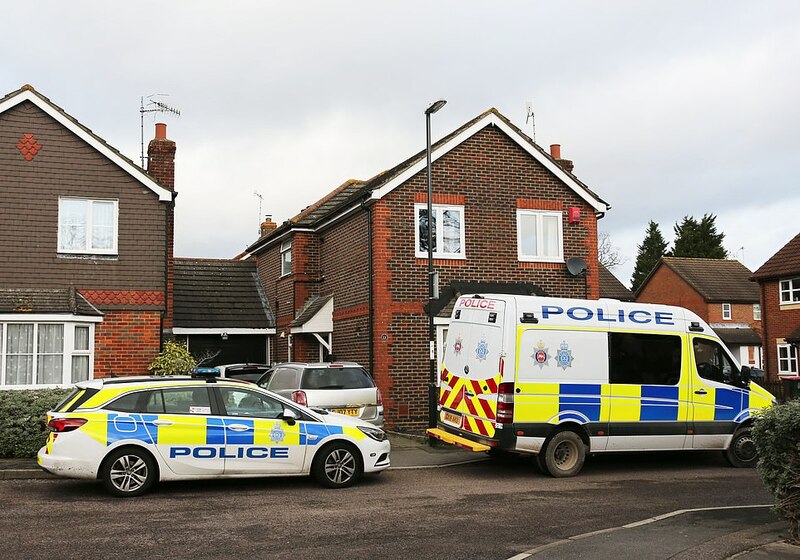 Forensic teams are said to be trawling through a van outside of a property in Auckland Close, Crawley, which is around five miles away from the airport. The arrests come as police look into theories as to whether eco-warriors or a group of activists protesting deportations of migrants could be behind the drone mayhem. Crawley, a town with a population of just over 100,000, is just five miles away from Gatwick and under the airport’s flightpath. Activists in the town have previously declared a ‘state of emergency’ in the countryside to counter a proposed second runway. 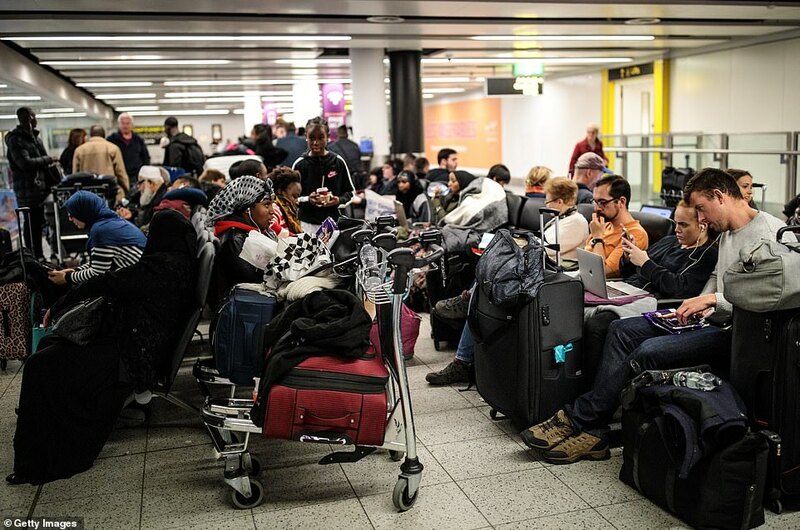 Around 1,000 aircraft have been cancelled or diverted amid this week’s mayhem, plunging 140,000 passengers into chaos since Wednesday night. 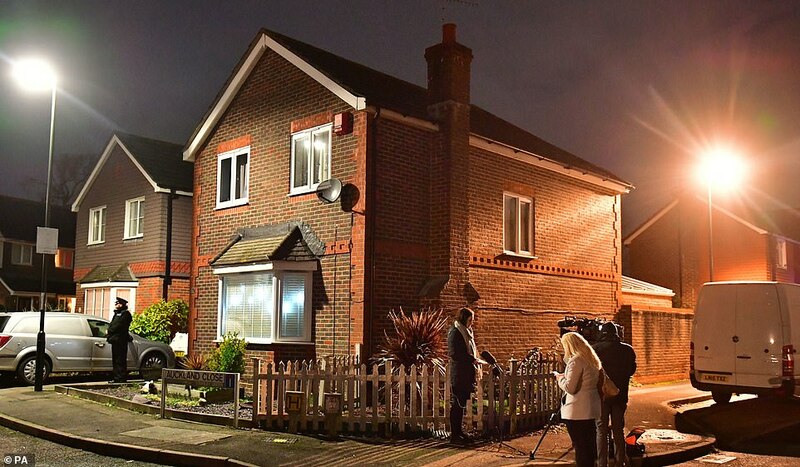 Speaking to MailOnline Ludmila Adomako, 69, a former Home Office worker and neighbour of the suspects, said: ‘I used to see Paul flying a small drone around the cul-de-sac from his driveway. ‘The drone wasn’t very big but he would fly a model aircraft and helicopter as well as race a small model sports car around his house. ‘He worked for a double glazing firm. In the summer he knocked on my door and gave me a quote for having some glass in my conservatory replaced. It was the first time I’d really spoken to him. ‘We got on to talking about family and I told him that my daughter had died and he put his arm around me and said ‘I’m sorry to hear that’. I thought that was quite a nice human touch. ‘He said that he had a teenage son who was living with his ex-wife and he worried about him all the time. ‘Paul and his wife also had a daughter who lived with them. I can’t say for sure how old she was but it was either late teens or early 20s. ‘The police came round to speak to me about Paul and Elaine this morning and I asked the officers if it was about the drone attack on Gatwick and they said yes. Another neighbour who asked not to be named said: ‘He’s like a big kid to be honest with his gadgets. In the summer he’s always stood outside the front of his house flying either a drone, a helicopter or aircraft. ‘He had a few drones, one that I saw him flying a few times was pretty big, he used to have to put it in his van sideways so it’d fit. ‘I spoke to him a few times but he never mentioned anything about Gatwick or complaining about the noise from planes. Bob Simpkin, 74, said: ‘Paul is what you could describe as an average person, a hard working builder. I was shocked to hear what happened, I do believe the police have got the wrong people – this is totally out of character. ‘Last night I heard a lot of screaming and shouting, when I looked outside I saw a woman being led to a police van by a female copper. ‘The van was parked outside their house and I saw a woman led into the van. Paul and Elaine have been together for about five years – I sometimes see a young lad of about ten there too. ‘Elaine doesn’t seem the person to get involved in any trouble – she works a lot too from what I can tell. Were they the couple who flew the drone at the airport? I don’t think so. Another neighbour, who wished not to be named, said: ‘They don’t seem the type to do this, they’re down to earth. He’s a builder and she works somewhere six days a week. ‘Paul likes his gadgets, he only ever used his drone in the street – you could hear all that buzzing sound. I haven’t seen them use it recently but its winter so it’s dark. The suspects: Who could have carried out the drone attack? 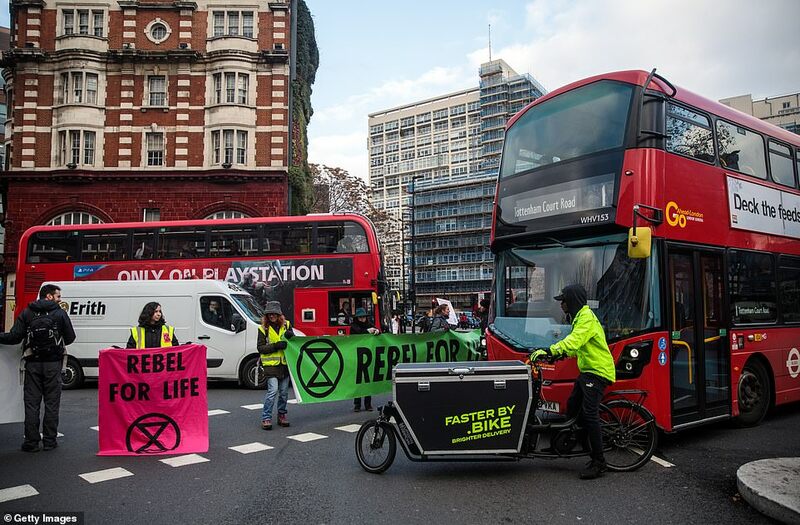 Environmental activist group: Groups such as Extinction Rebellion and Plane Stupid have been carrying out increasingly high-profile stunts in recent months, but no one has claimed responsibility over yesterday’s action. ‘Lone wolf’: The incident may be the work of an anarchistic loner who wanted to make an impact and cause carnage. Immigration campaigners: In the wake of convictions of the ‘Stansted 15’ earlier this month, a case involving activists who stopped a deportation flight, it is possible a copycat campaigner tried to stop a planned deportation. Extortionist: Some have suggested an extortionist could be using the financial damage caused by the drone flight to extort money out of one of the many businesses hurt. Mr Gait is also said to have fallen out with his next door neighbour over a boundary issue. A friend of his told MailOnline: ‘Paul told me that his neighbour’s hedge was quite overgrown and that he was having difficulty parking his van. ‘He said that he’d asked the neighbour if he could trim the hedge back slightly but he refused and so they didn’t speak again after that. ‘I haven’t seen Paul or Elaine all day. They have two dogs, a Jack Russell and a pug, which they take out for walks every day but we’ve not seen them at all. Last night motorist Paul Motts, 52, revealed he saw a man in his 30s wearing hi-vis clothing and crouching over a drone in a country lane near the West Sussex airport on Thursday. Mr Motts said the suspicious man had been trying to ‘get away as fast as he could’ as Sussex Police combed the countryside to find the drone pilot. He told The Sun: ‘I was delivering a parcel and drove past a suspicious man in fluorescent cycling gear crouching over a large drone which was all lit up. ‘It looked like he was packing the drones away. Two minutes later we turned around and came across him cycling away. The major flight disruption at London Gatwick today comes just five months after new laws banned drones from flying too close to airports. Legislation implemented in July means people in Britain are now banned from flying the devices above 400ft and within 1km (0.6 miles) of airport boundaries. Drone users who flout the height and airport boundary restrictions could face an unlimited fine, up to five years in prison, or both. Laws introduced to the Commons in May mean people flying drones which weigh 250g or more will have to register with the Civil Aviation Authority (CAA). Drone pilots will be required to take an online safety test under the new legislation, with the requirements set to come into force in November next year. Research has found a drone weighing 400g (14oz) could smash a helicopter windscreen, and one at 2kg (4lbs) could critically damage an airliner’s windscreen. In July, the DfT said it was considering introducing an age restriction, banning children from owning drones weighing at least 250g. It also said it was considering giving police the power to issue on-the-spot fines of up to £300 for misuse and the ability to seize drones being used irresponsibly. There have already been 117 near misses between manned aircraft and drones up until November this year, compared to 93 for the whole of 2017. Another neighbour, speaking from a home illuminated by neon Christmas lights and tinsel, described seeing Paul Gait operating a remote-controlled car, Jeep and a small helicopter. The man, who did not want to be named, said: ‘I remember laughing one time because I thought he was going to crash it, I don’t think he knew what he was doing, he was driving this remote controlled Jeep in the street. 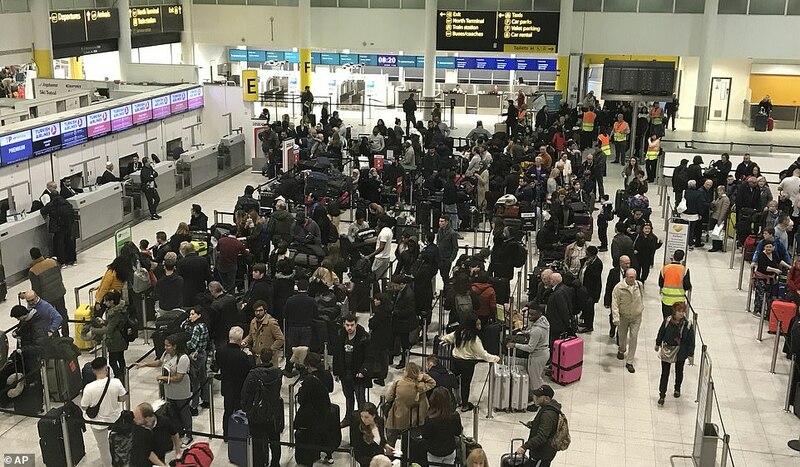 Sussex Police said in their statement: ‘As part of our ongoing investigations into the criminal use of drones which has severely disrupted flights in and out of Gatwick Airport, Sussex Police made two arrests just after 10pm on Friday (December 21). ‘Our investigations are still ongoing and our activities at the airport continue to build resilience to detect and mitigate further incursions from drones, by deploying a range of tactics. 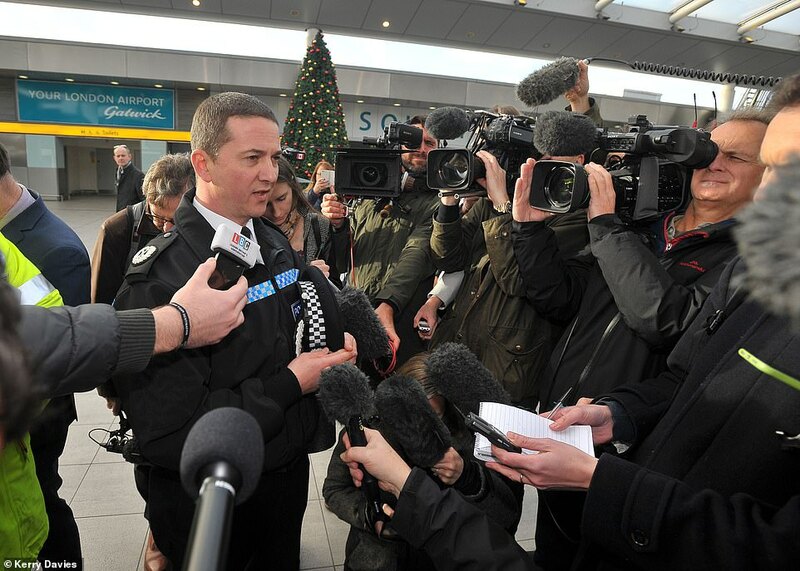 ‘We continue to urge the public, passengers and the wider community around Gatwick to be vigilant and support us by contacting us immediately if they believe they have any information that can help us in bringing those responsible to justice. ‘The arrests we have made are a result of our determination to keep the public safe from harm, every line of inquiry will remain open to us until we are confident that we have mitigated further threats to the safety of passengers. ‘Anyone with information about the incident or who may have suspicions about the drone operators is asked to report online or call 101 quoting Operation Trebor. If you see anyone acting suspiciously in the area of the airport, please dial 999 immediately. A Gatwick spokesman said earlier: ‘Many people will be due to fly today and there will be longer delays perhaps. 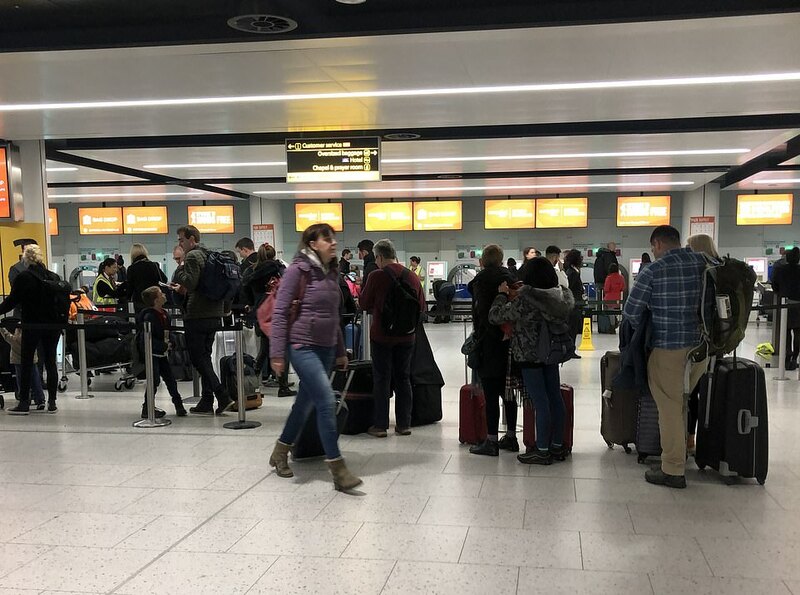 On Saturday, the queue for check-ins stretched the length of the departures hall – while a heavy stream of passengers poured through the arrivals gates as a full schedule of flights operated. 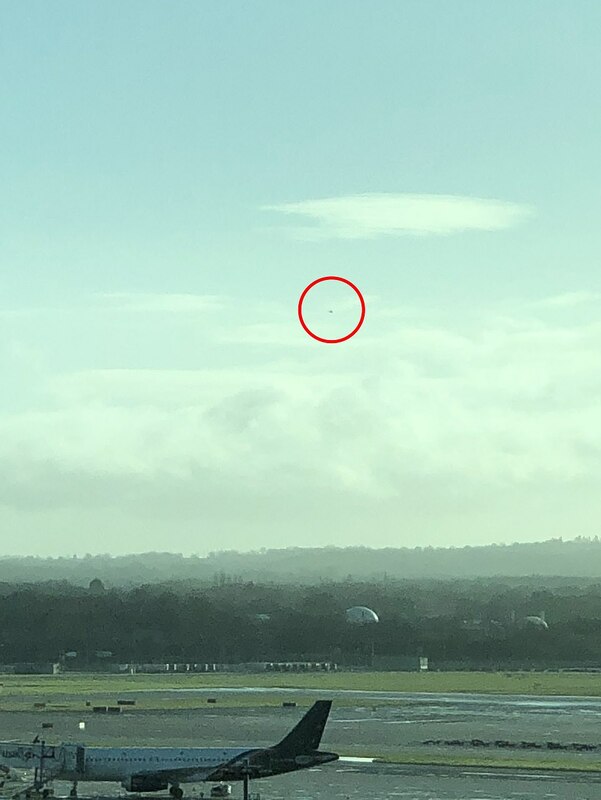 3pm: The drone is spotted again as it buzzes across Gatwick’s runway. It was just minutes after airport bosses announced they had hoped to re-open at 4pm. 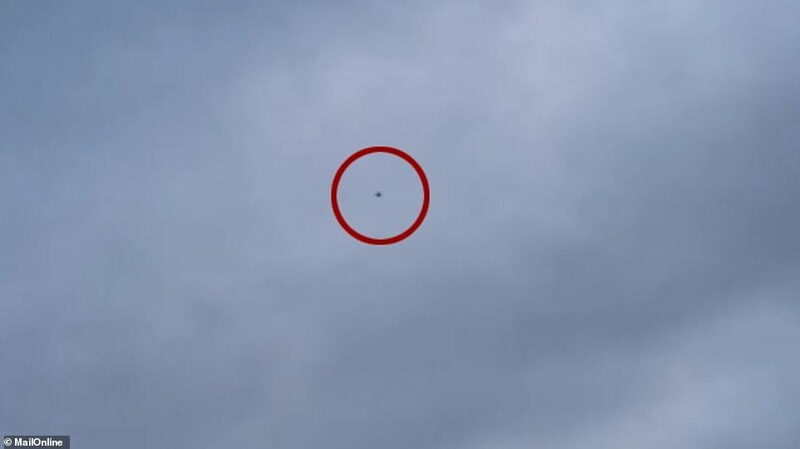 4pm: Drone spotted flying over the runway yet again. In the departures line was the Shorrock family, from Oxford, who were flying to Innsbruck in the Austrian Alps for a skiing trip. 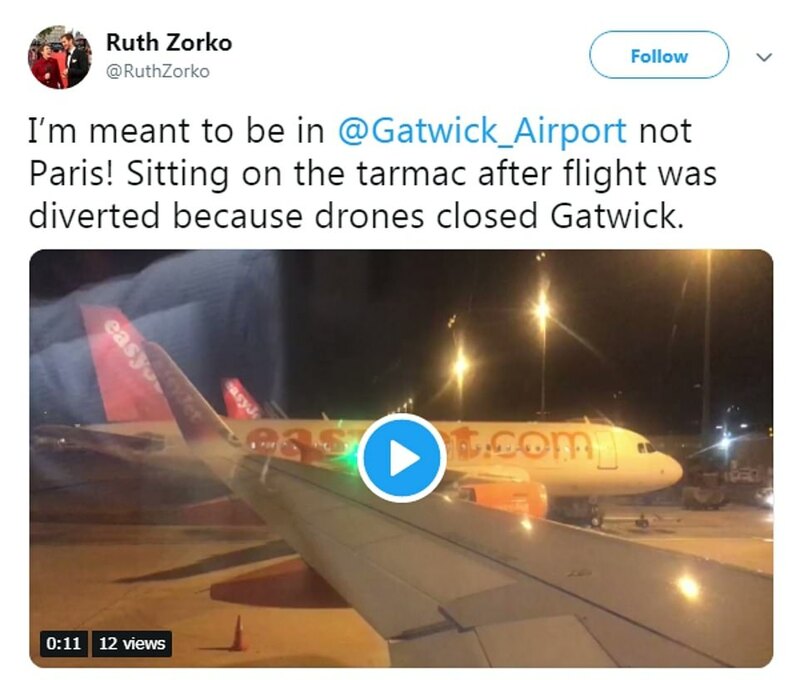 Vivienne Shorrock was ‘relieved’ to have avoided the drone disruption as she was worried the family’s non-refundable holiday would go to waste. ‘But then we thought well it’s a middle class problem isn’t it. Oh no, we can’t go on a skiing holiday,’ she said. David Shorrock joked the drone drama was a ‘nice distraction from Brexit’ before offering a novel solution to the problem. ‘They should’ve got some farmers here. They would’ve soon sorted it out,’ he said. Planes were grounded again at 5pm on Friday when a drone was sighted above the airfield before air traffic resumed with severe delays. 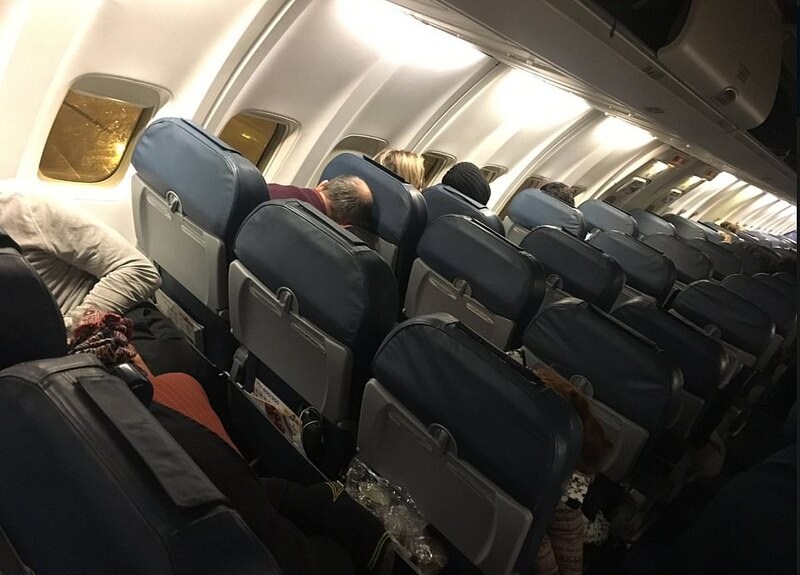 One flight from Morocco appeared to be just moments away from landing when it was forced to divert only 1,000 feet above the ground last night while other passengers were sitting ready for take-off when pilots told them of another sighting. 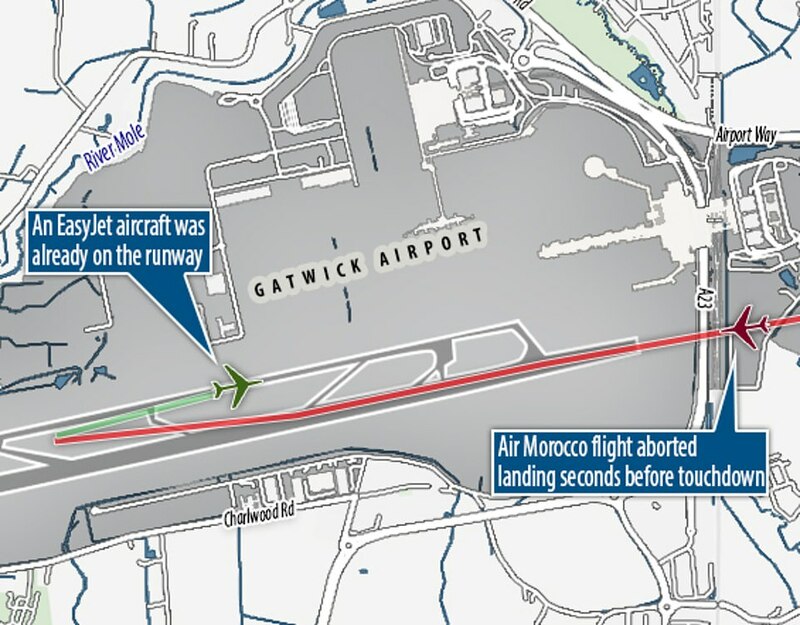 Just over an hour later Gatwick said planes had returned to the air, saying the ‘military measures in place at the airport’ would ensure the safety of passengers. The Army had earlier used jamming devices in the hope of knocking the drone out of the sky as police scoured the Sussex countryside in a bit to find the culprit. 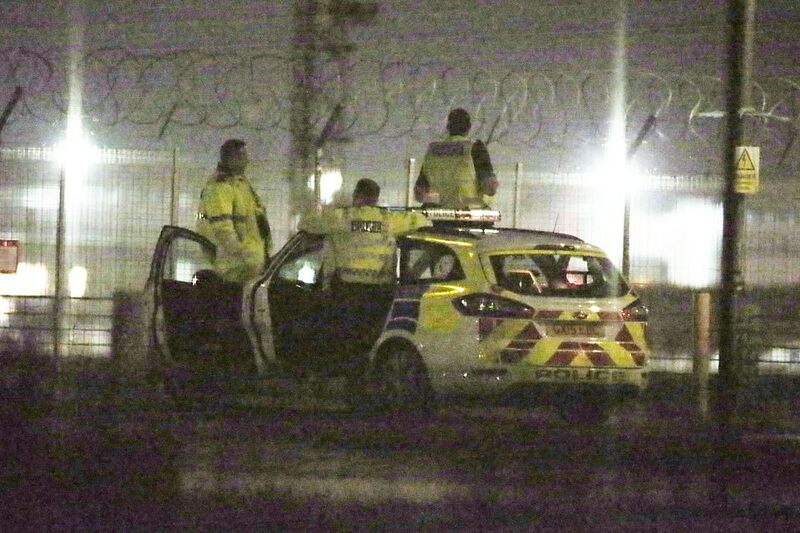 Police said they were closing in on the pilots who allegedly used ‘multiple’ drones to shut down Gatwick’s runway and are even claimed to have taunted officers by zooming over their heads while flashing lights at them. 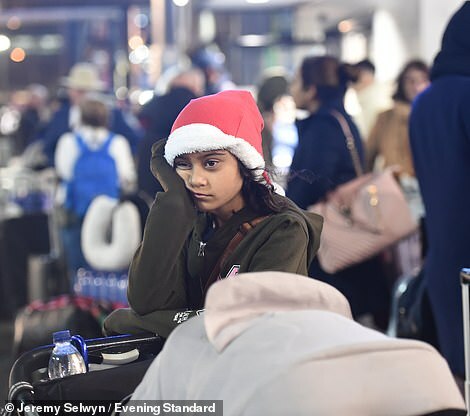 Passengers were left with Christmas plans ruined, with some forced to abandon holidays abroad while others struggled to return to the UK in time for December 25. 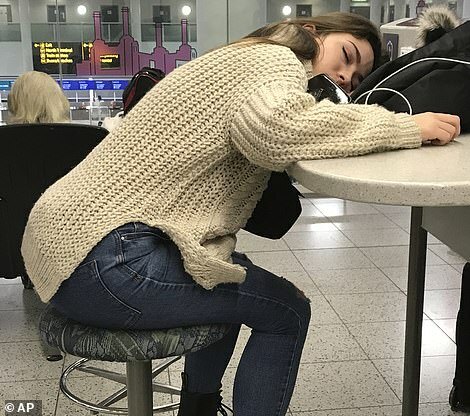 One had to fork out thousands of dollars for a one-way ticket from New York to get back to the UK from New York after her flight could not reach Gatwick on Friday morning. Scarlette Tidy was booked on a Norwegian Air flight to Gatwick but by the time she was told the trip was cancelled, all the airline’s flights to London were sold out until after Christmas. With passengers waiting two hours for a ‘live chat’ on Norwegian’s website she was forced to spend over $3,000 – several times what she had originally paid – to reach her family in time for Christmas. She said the experience had been a ‘total disaster’ but that she was now en route back to London. 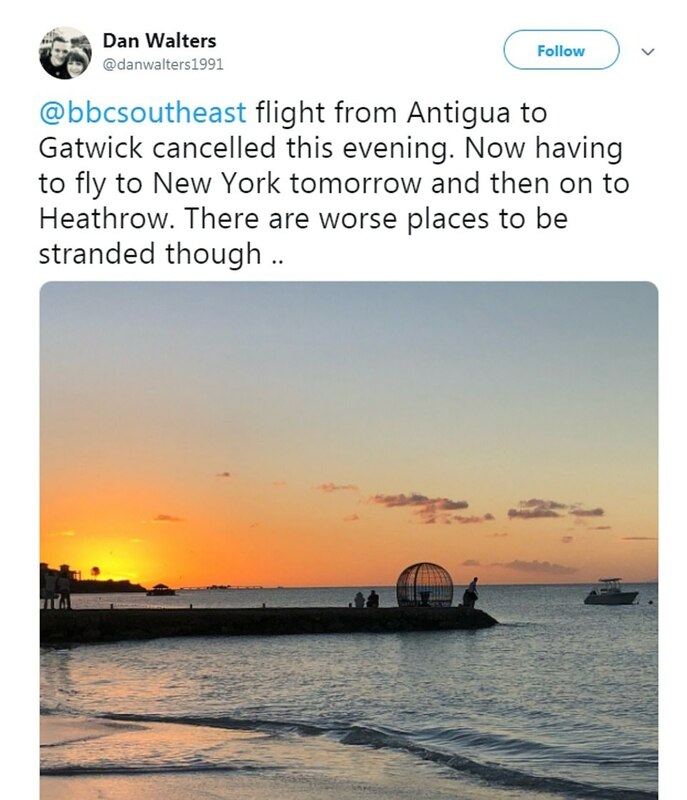 Another passenger, Emma Jewell, told MailOnline she and her boyfriend were stranded in the Dominican Republic after her flight to Gatwick had been cancelled. She said the airline had rebooked them on a flight to Heathrow via Philadelphia, but her boyfriend’s ESTA for the United States did not come through in time and they could not board the flight. 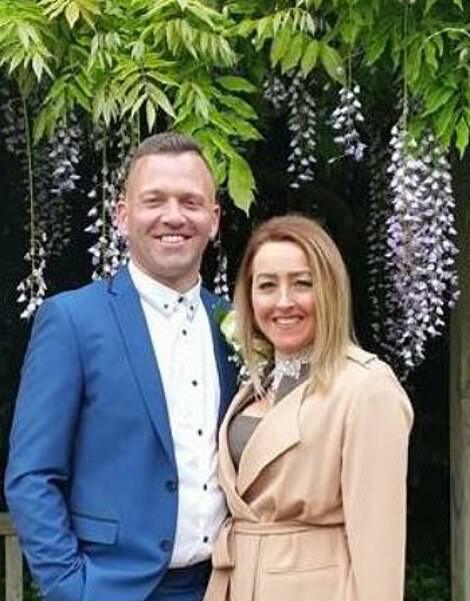 The couple then boarded a flight to New York only to find there was a problem with the air conditioning, leaving them waiting on the tarmac and certain to miss their connection to the UK. 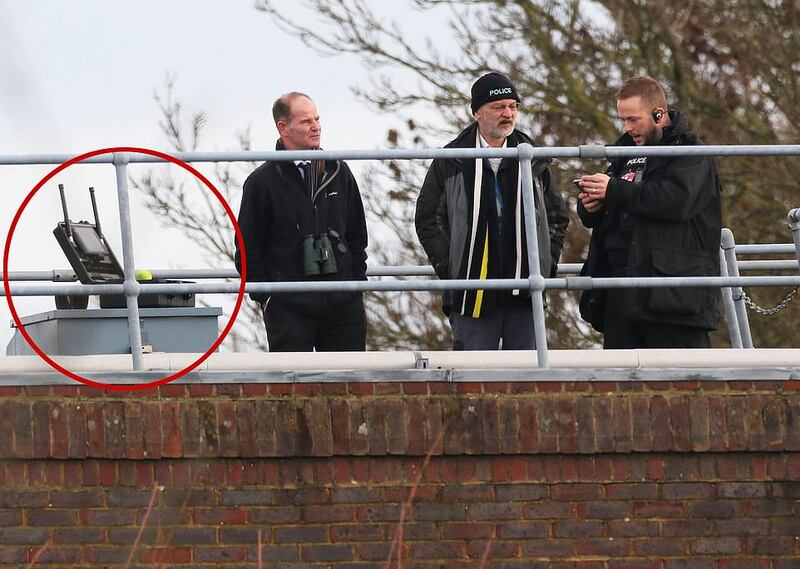 How could the drone breach Gatwick’s army protection zone? The drone could be programmed to fly on a pre-set path over the runway to cause major disruption before continuing to its landing zone. 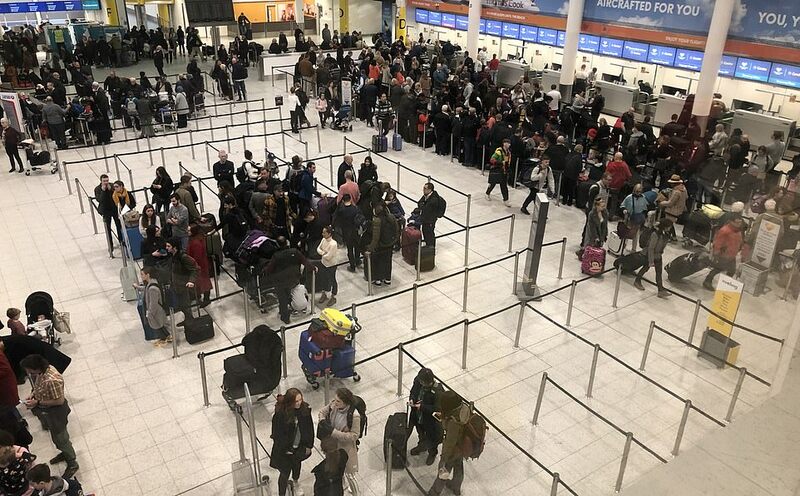 Amit Samani, UK sales manager at drone detection technology firm Dedrone, said it was possible for an operator to evade the army’s coverage around Gatwick Airport. He told MailOnline: ‘There is no one singular sensor detection technology that can detect 100 per cent of drones. He said the Dedrone platform is a ‘fully automated counter-drone solution’ which ‘detects, classifies and mitigates drone based threats’. Sensors can visually identify drones, pick up their radio signals or even listen to the distinctive sounds of their motors. The Army brought in its jamming devices as the chaos unfolded. 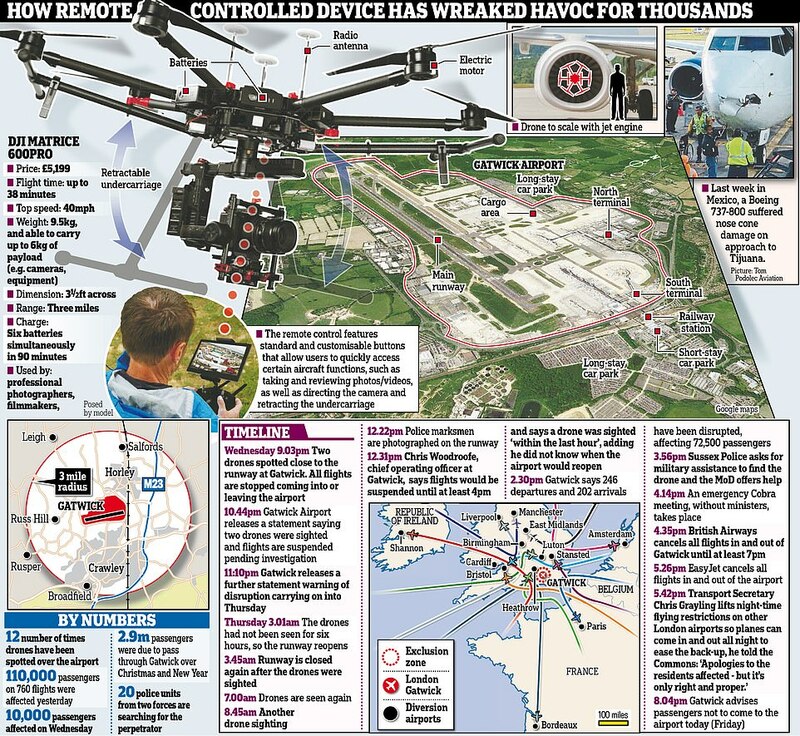 A similar arsenal of weapons was used by British and US forces to help liberate Mosul in Iraq and neutralise ISIS drones – but passengers trapped at Gatwick are furious the weapons were not brought in earlier. 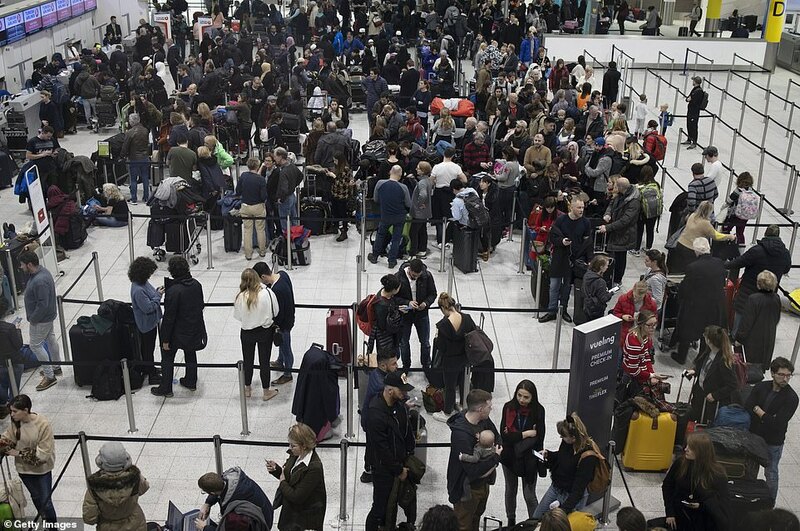 Security and defence consultant Declan Power told MailOnline: ‘The Gatwick situation is a very worrying development as it seems to involve technology which you can buy over the counter and has managed to cause major disruption to one of the UK’s busiest airports. ‘I am astounded that electronic countermeasures were not in place to prevent drones from approaching the airport. ‘The level of disruption caused means that airports across the world have to learn from this. How was someone able to close down a major airport for more than 36 hours. ‘Police and security services are going to be highly embarrassed by these incidents. A major weak point in airline security has been identified. The person behind this seems happy to cause major disruption rather than attack aircraft. ‘But as the conflict in Syria has shown, it is not difficult to weaponise a drone which could be used in a terrorist attack. Airlines should be concerned. Transport Secretary Chris Grayling is also under pressure to explain why Britain’s second busiest airport has no anti-drone systems despite being early warning systems and jammers being common in the United States. Mr Grayling has insisted Britain is facing a ‘new threat’ – but today it emerged Gatwick has been troubled by drones near the runway three times in the past 18 months. He admitted it could have been a larger gang of climate change activists flying several drones and refused to rule out the chance a hostile foreign country could be behind the Gatwick drone chaos. Stewart Wingate, Gatwick’s CEO, said on Thursday it ‘cannot be right’ that a major international airport could be targeted in this way. 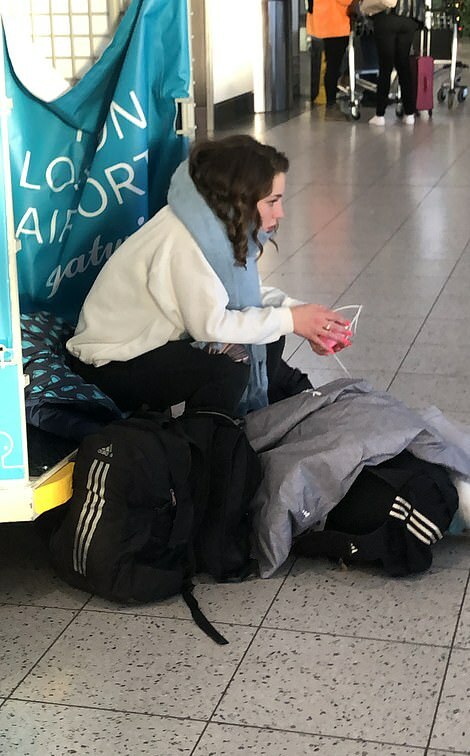 He said: ‘On behalf of everyone at Gatwick I would like to repeat how sorry we are for the inconvenience this criminal behaviour has caused passengers and we share their real anger and frustration that it has happened. ‘This is a highly targeted activity which has been designed to close the airport and bring maximum disruption in the run-up to Christmas. ‘Although not for today, these events obviously highlight a wider strategic challenge for aviation in this country which we need to address together with speed – the aviation industry, government and all the other relevant authorities. 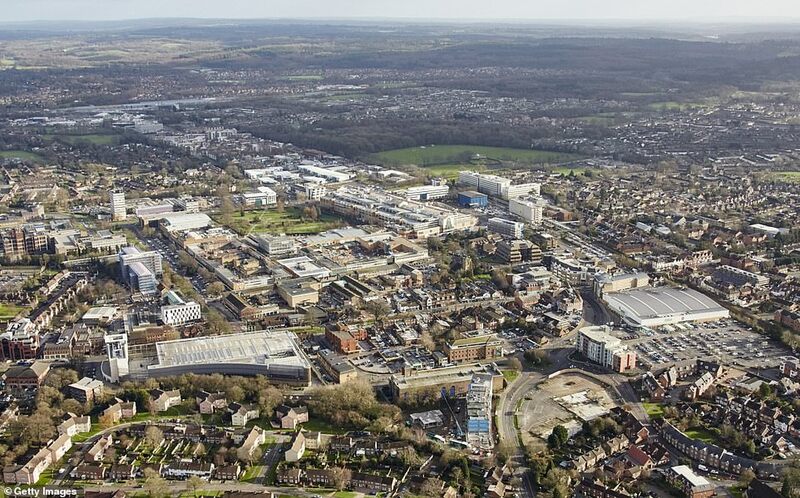 Crawley, the home of the two suspects arrested in connection to drone activity at Gatwick, has been the battlefield against proposed expansion of the airport. Speculation as to the identity of the two suspects, a man aged 47 and a woman aged 54, continues to mount, as police look into theories as to whether eco-warriors could be behind the drone mayhem. 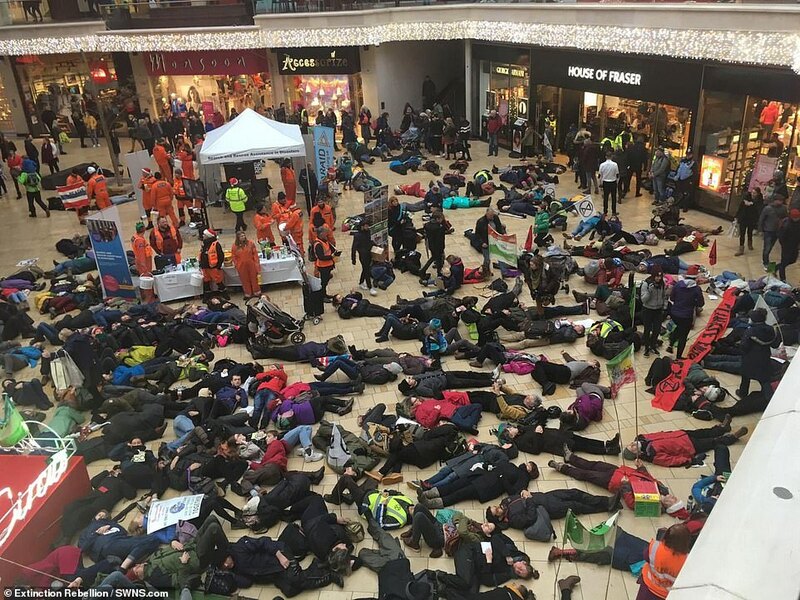 One campaign group in the area, the Communities Against Gatwick Noise and Emissions (CAGNE), labelled the drone mayhem which has affected more than 140,000 passengers ‘an early Christmas present’. 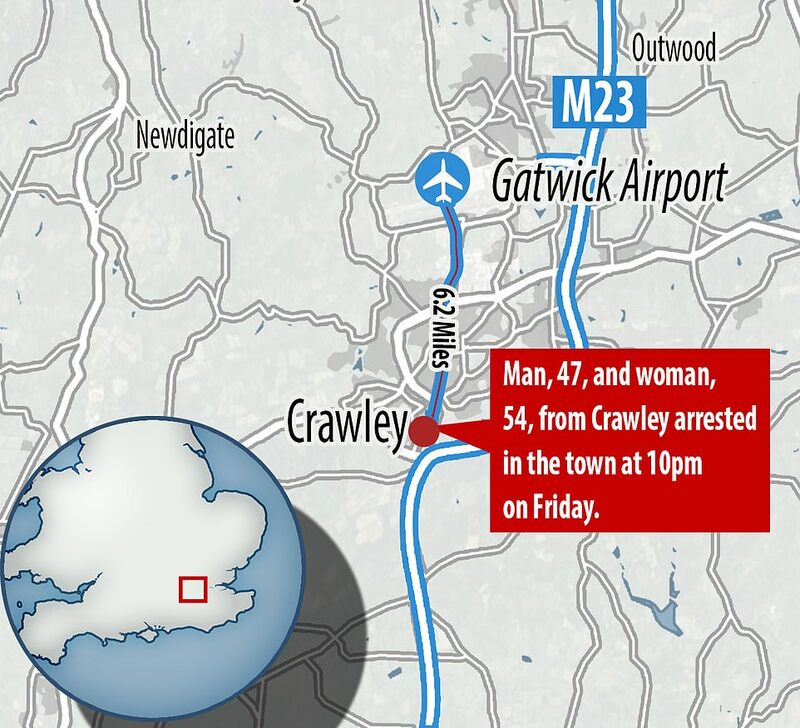 The two suspects were arrested at around 10pm in the town, which is just five miles away from Gatwick and is under the airport’s flightpath. 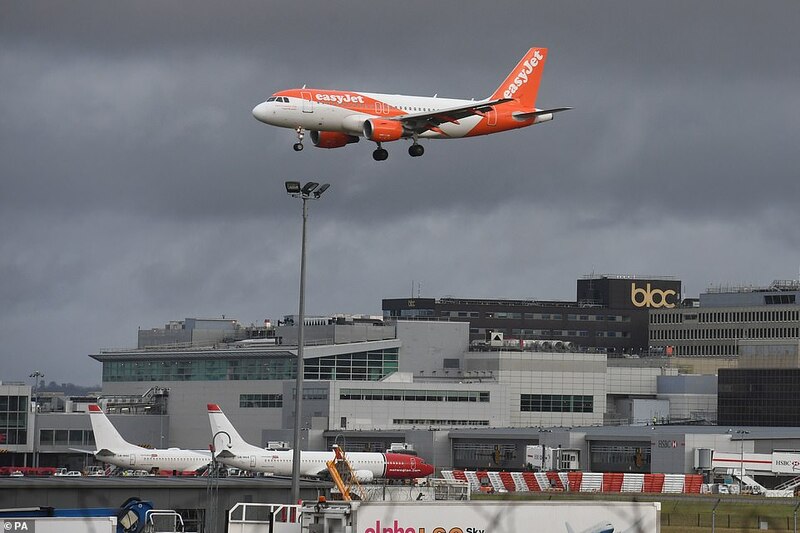 Much to the anger of many local residents and environmentalists, the UK’s second-busiest airport has sought permission to open its emergency runway to increase capacity of the airport by an estimated 20 to 30 per cent. Gatwick has proposed spending £500m to widen its emergency runway and bring it into daily use, as part of a plan that could see 100,000 additional flights a year by 2032. But CAGNE accused the airport of trying to seek ‘a second runway by the back door’. And the Sussex branch of the Campaign to Protect Rural England (CPRE) had declared a ‘state of emergency’ in the countryside to counter the airport’s plan. The CPRE in a statement said: ‘The Master Plan details the airport’s proposal to expand from one to potentially three runways. David Johnson, CPRE chair, said expansions would have a ‘devastating impact’ on the countryside. He added: ‘For this reason we are declaring our first ever ‘Countryside State of Emergency’ to protect what we hold dear – our rural communities and the natural beauty and tranquillity of our county. 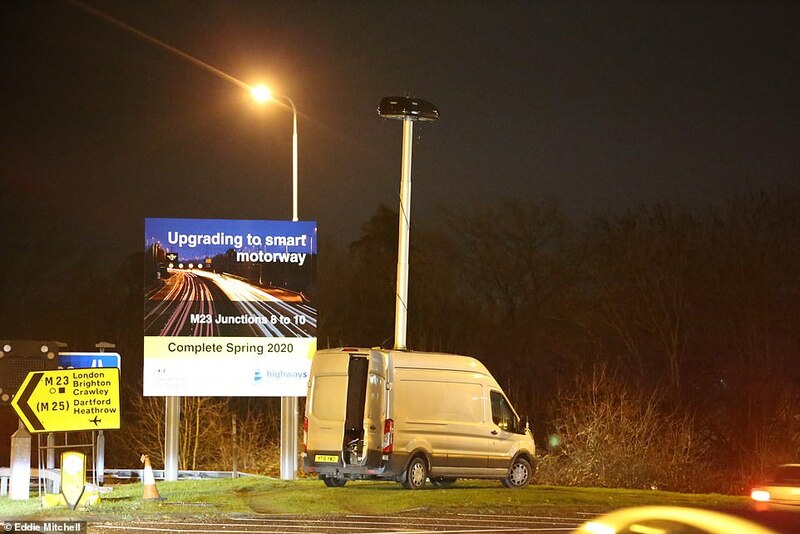 Angry residents in Crawley and the surrounding towns lodged more than 17,000 complaints after a new flight path was implemented by Gatwick Airport. 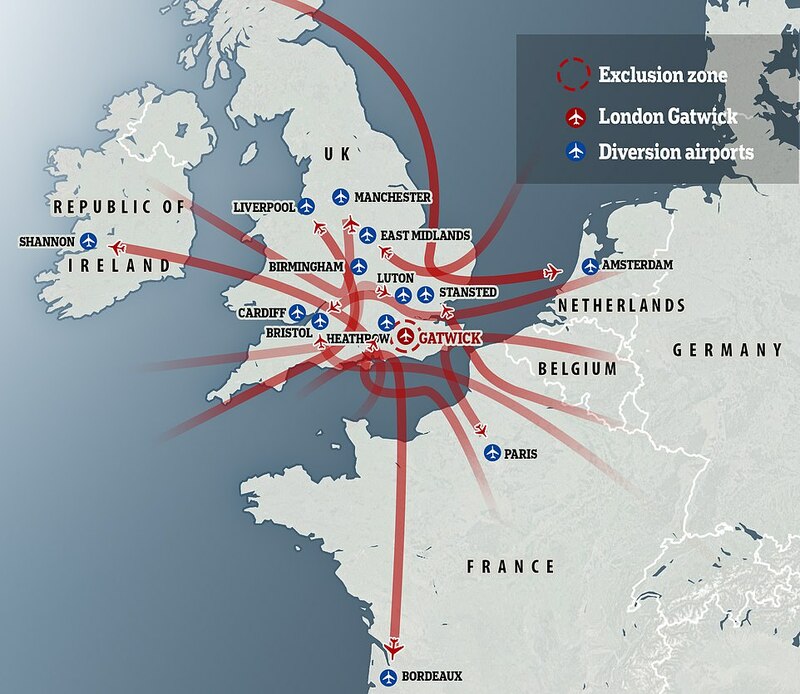 Despite the wave of complaints, Gatwick refused to change its flight path, claiming it was ‘satisfied the modified Route 4 is achieving this performance and it will therefore remain in place’. The Communities Against Gatwick Noise Emission (CAGNE), Gatwick Area Conservation Campaign (GACC) and the Sussex branch of the Campaign to Protect Rural England are among a handful of pressure groups in the area looking to push back on Gatwick’s growing influence in the area. CAGNE, former in 2014, claims it was ‘at the forefront in opposing the expansion of Gatwick Airport with a second runway for sound reasons and will object strongly to the emergency runway’. In 2003, more than 500 protesters at a protest organised by the GACC fought against plans for a second runway at the airport. Some laid down in front of a bulldozer as it was held at bay at the entrance to the wood. 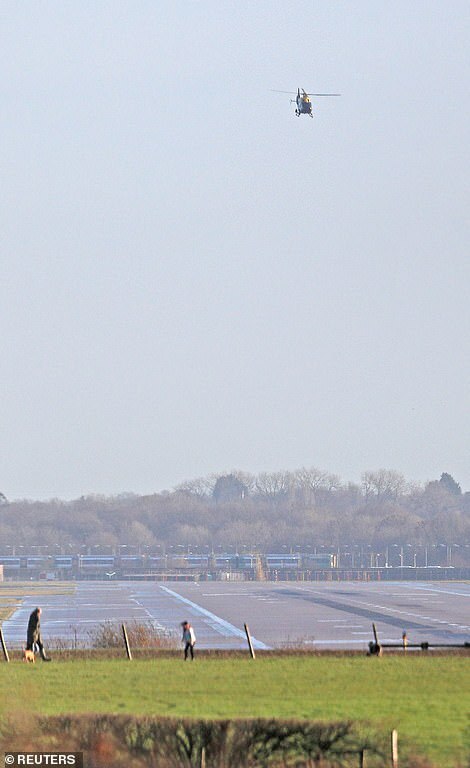 Gatwick’s master plan for a second runway were published in October this year and has begun a 12 week consultation process which is due to end in January 2019. The document predicts, with a second runway, the airport could handle between 68 and 70 million passengers by 2032. 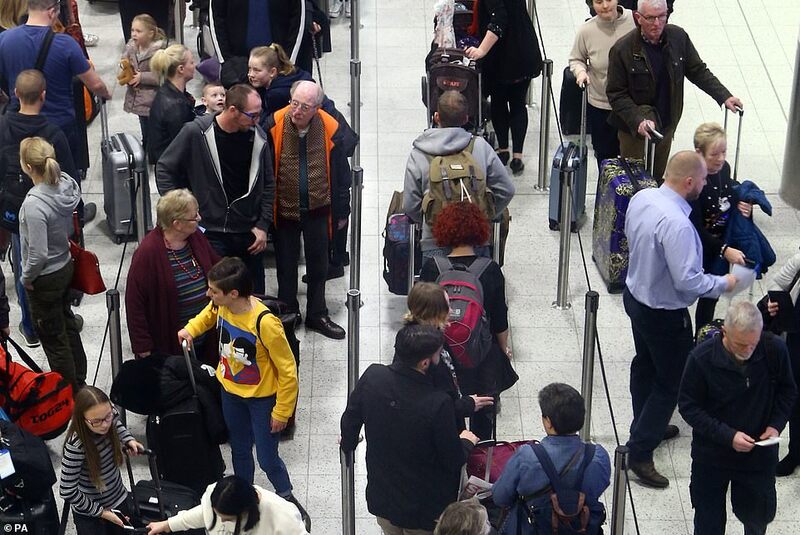 Gatwick travel chaos: What are consumers entitled to and can they get compensation? – Will those affected be entitled to compensation? Consumer rights experts say that despite the frustration for those who have suffered disruption, these are ‘extraordinary circumstances’. Alex Neill, Which? 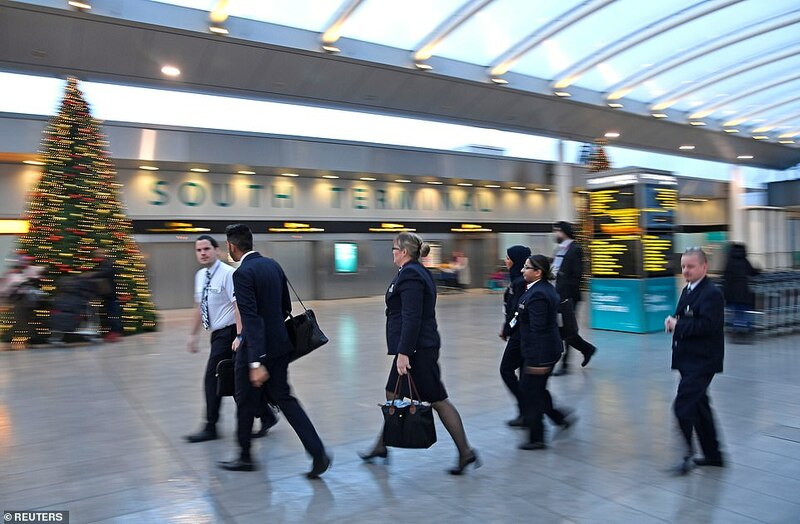 managing director of home products and services, said: ‘This situation will understandably be frustrating for both the airlines and the tens of thousands of passengers travelling to and from Gatwick ahead of Christmas. ‘Whilst these extraordinary circumstances unfortunately mean you are not entitled to compensation, you may still be entitled to meals, refreshments, hotel accommodation or transfers. – What are extraordinary circumstances? Compensation for delayed or cancelled flights hinges on the reason for the delay and the length of notice passengers are given. Which? says that in cases where the airline can prove the delay was caused by extraordinary circumstances, no compensation is payable. Extraordinary circumstances are situations out of the airline’s control, for example, a security risk, political instability or severe weather that makes flying dangerous. – What support can people get? Which? 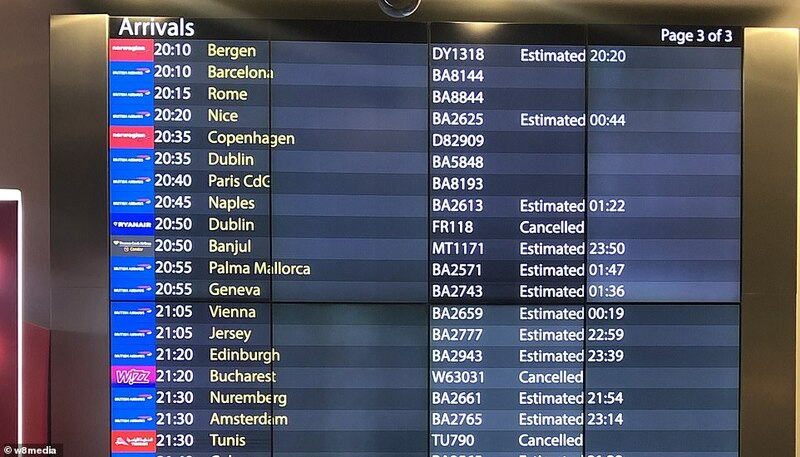 says that if someone’s flight is delayed for at least two hours, depending on the length of the flight, their airline may give them two free phone calls, faxes or emails; free meals and refreshments appropriate to the delay; and free hotel accommodation and hotel transfers if an overnight stay is required. 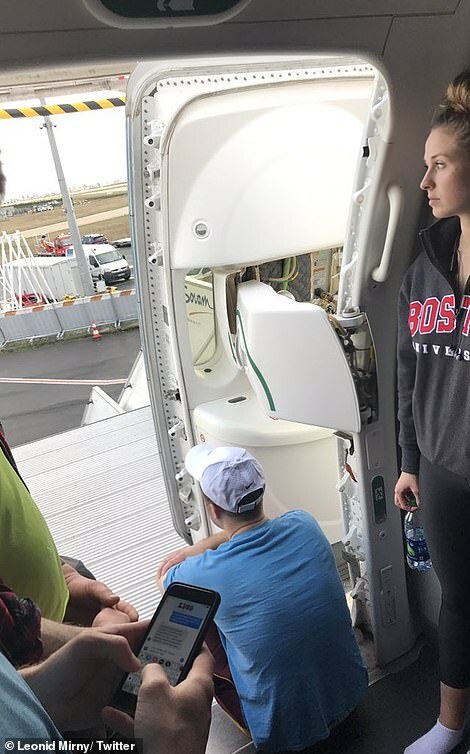 If a flight was delayed for more than five hours they may be able to choose between being rerouted on a different flight or getting a refund – just as if the flight had been cancelled. – How can insurers help? Martyn James, spokesman for consumer help website Resolver.co.uk, suggests that as well as speaking to the airline, ‘you can also speak to your travel insurer to see if you have any options in your insurance policy’. Giving general advice, the Association of British Insurers said people should speak to their airline or travel company first. Insurer Axa says if customers need to change the dates of their trip they should make contact to update their policy. 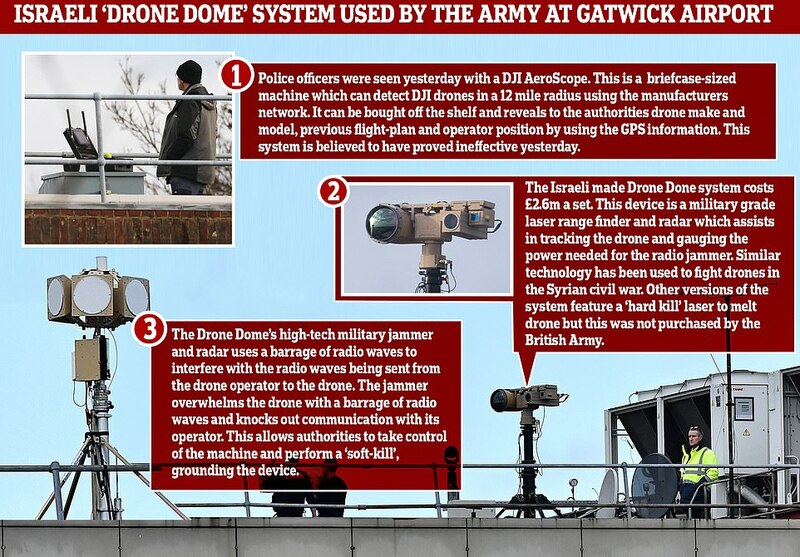 The Army used a cutting-edge Israeli anti-drone system to destroy the unmanned aerial vehicle (UAV) that brought misery to hundreds of thousands of people at Gatwick airport. The British Army bought six ‘Drone Dome’ systems for £15.8 million in 2018 and the technology is used in Syria to destroy ISIS UAVs. 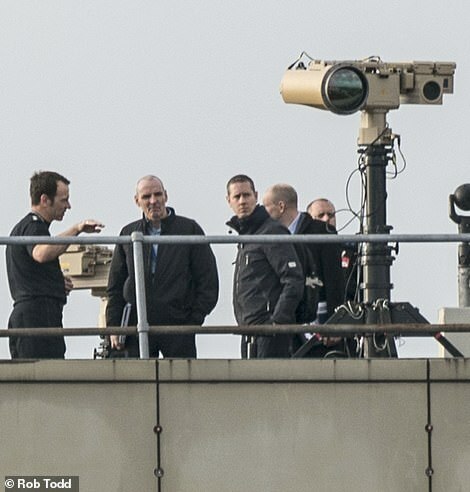 However, the drone used at Gatwick is thought to have been either hacked or an advanced non-DJI drone, which rendered the commercial technology used by the police useless. At that point, the Army’s ‘Drone Dome’ system made by Rafael was called in. Details of the system are publicly available. Army officers use a high-tech radar and a laser rangefinder to locate drones within a 2.1 and 6.2 miles radius. 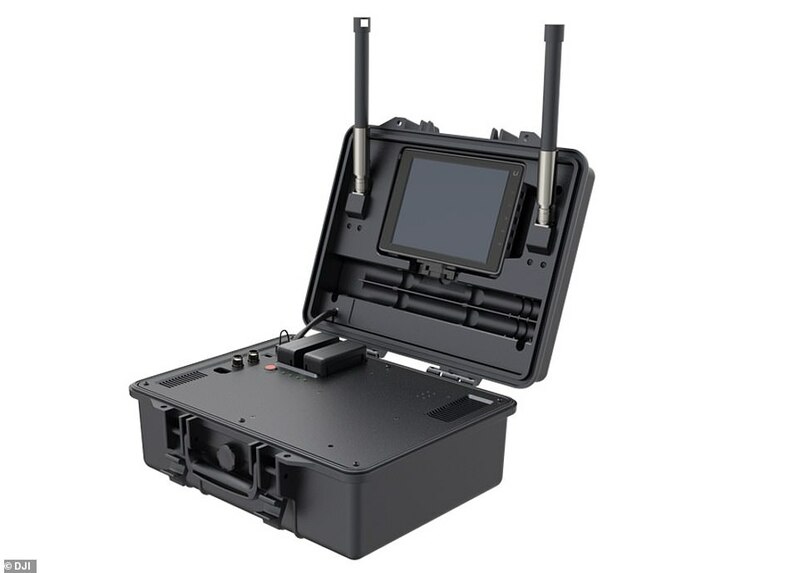 Once the system has a lock on the drone, a radio frequency jammer is then used to overload the drone with signals – knocking out the commands from the unknown owner. This can be used to make a ‘soft-kill’ and cease control of the unmanned aerial vehicle (UAV) and land it safely. 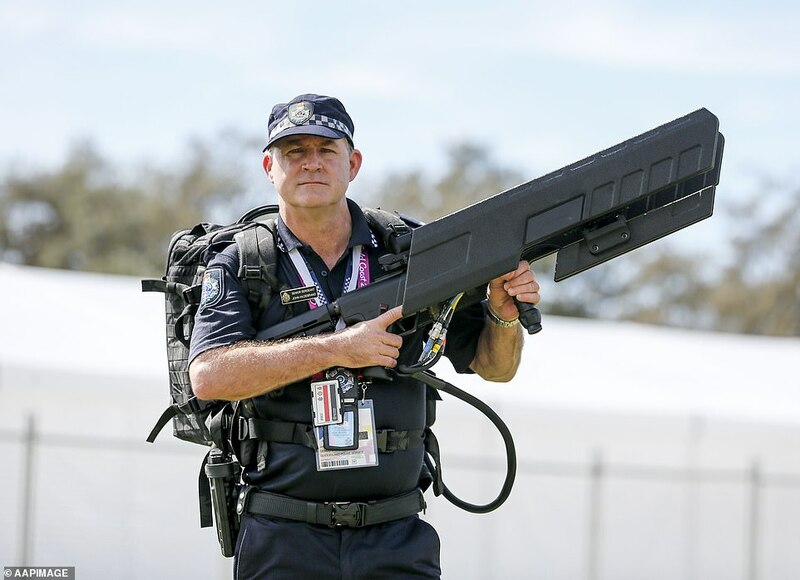 The system also comes with a high-powered laser which can make a ‘hard-kill’ on drones by effectively melting them, but the British Army did not buy this version. 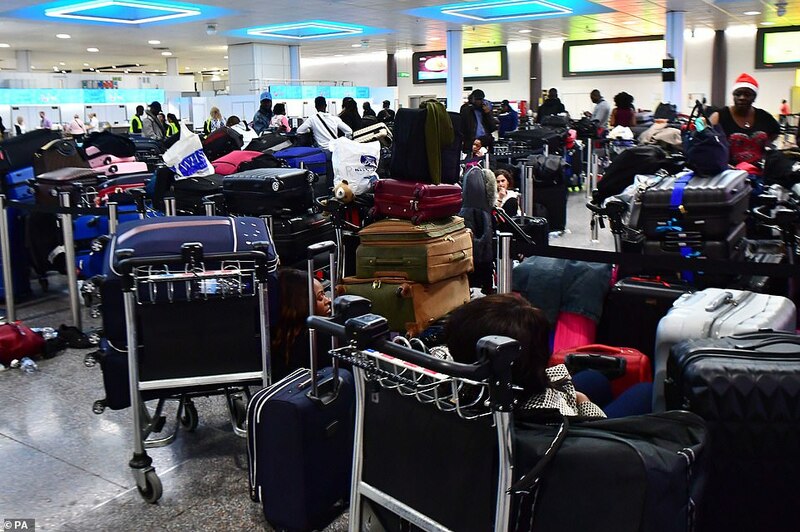 What should you do if you have a flight from Gatwick Airport? 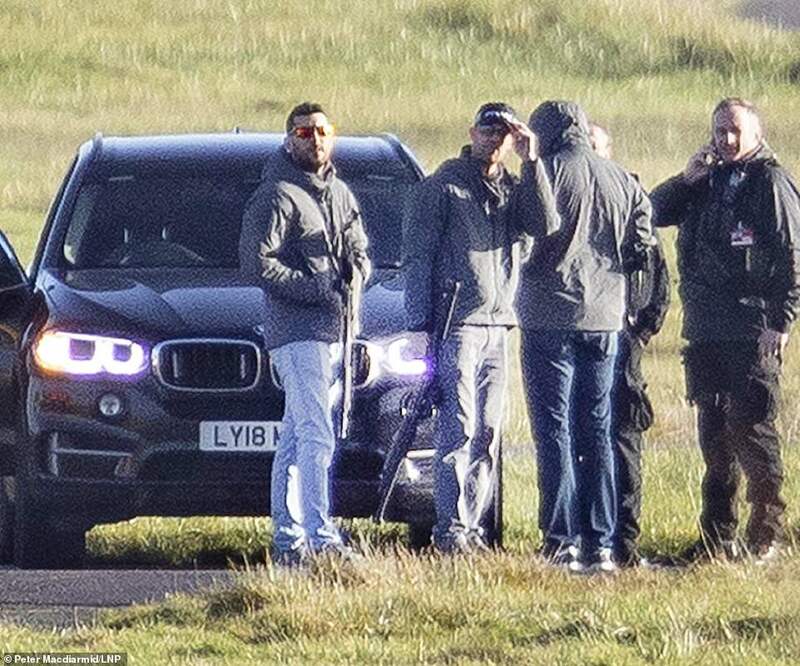 George Burne, a UAV strategist at COPTRZ, a commercial drone firm based in Leeds, told MailOnline that the likely way the Gatwick saga concluded was with the criminal’s capture. COPTRZ supply high-end commercial drones as well as anti-drone technology. 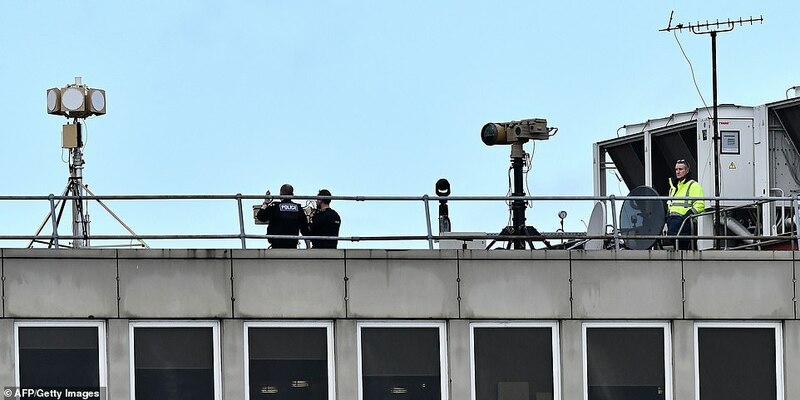 The DJI Aerospace AeroScope device, a briefcase-sized machine with two protruding antennae, was spotted being used by police on a rooftop around Gatwick. It is a complex piece of equipment which is designed to detect drones by manipulating the radio frequency it is operated on. It allows authorities to piggybacks this signal without the operator knowing with a ‘sleeper-bot’. With sufficient time, specialists can utilise the GPS capacity of the drone to identify the location of the perpetrator, where the drone is, its make and model and also the flight-path the machine has been on. Once police have this information, they are able to active a feature which is in-built in all drones known as ‘return to home’. This ground-based device is used throughout industry and at many events to ensure protection from drones. 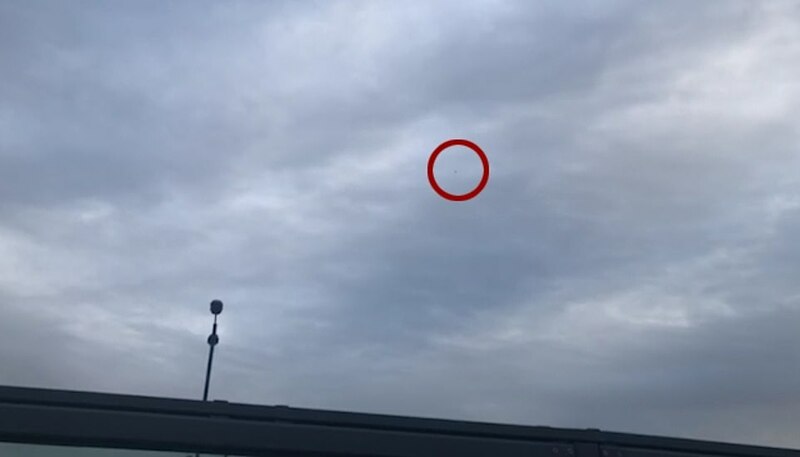 ‘The detection system is able to pick up frequencies from up to 20 km (12 miles) away and gives a huge radius to spot the machines,’ Mr Burne told MailOnline. A lone wolf eco-warrior or a group of climate change activists could be behind the most damaging drone assault on a UK airport in history. Airports are prime targets for environmental demonstrators who have chained hemsleves to aircraft, invaded runways and blocked access roads in recent years. The sabotage which grounded hundreds of flights and left thousands stranded is believed to have been ‘targeted’ and the sophistication of the equipment involved suggests it was well-planned and financed. Gatwick is currently at the centre of a bitter row over plans to use its emergency runway to bring more than 100,000 additional flights a year. Police investigating the attack do not think it is terror related but Transport Secretary Chris Grayling today refused to rule out it being the actions of a foreign state. ‘I think it’s unlikely to be, but at the moment I’m not ruling out anything’, he added. The Cabinet minister also said that whoever the perpetrator or perpetrators were, they needed to ‘go to jail for a long time’. If no foreign agent was involved, that suggests three possibilities are among potential suspects; an organised campaign group, a lone eco-extremist or an anarchic hobbyist looking to cause carnage. 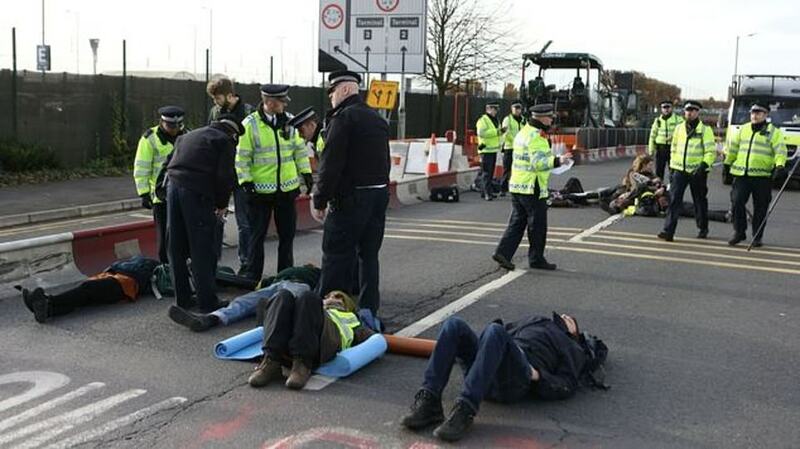 The most high-profile ‘direct action’ groups in the UK include Extinction Rebellion, who shut down central London in anti-traffic protests last month, and Plane Stupid, whose members chained themselves to Heathrow’s runway in 2015. The spokesman added that her group had nothing to do with the drone. She added that the police had not been in contact with them about the incident at Gatwick. Meanwhile 15 activists are facing jail after storming into Stansted Airport and grounding a Home Office deportation plane heading to Africa in March 2017. The group caused chaos using bolt cutters on the perimeter fence and chained themselves to a 767 chartered to transport detainees from UK detention centres back to Nigeria, Ghana and Sierra Leone. They will be sentenced on February 4. But nobody has yet claimed responsibility, raising suspicions that it a saboteur acting alone. 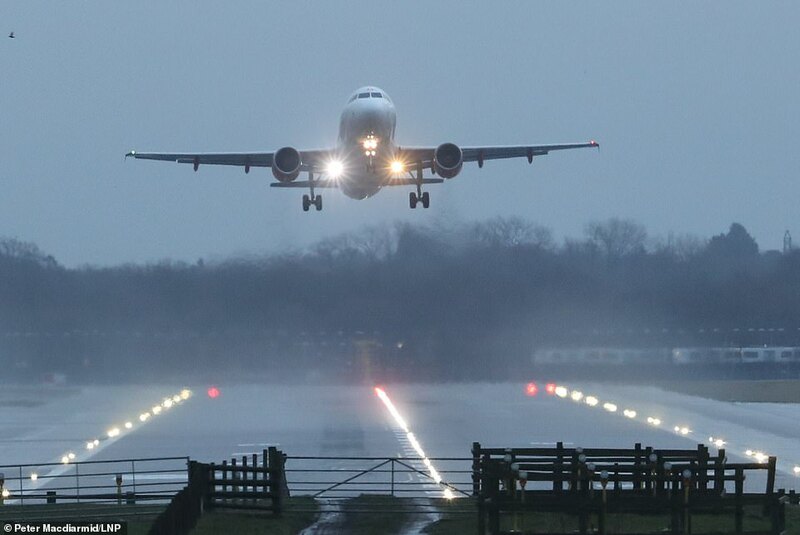 Gatwick Airport plans to widen its emergency runway to bring it into full passenger use. The scheme, revealed in October, would enable the UK’s second busiest airport to accommodate up to 109,000 extra flights a year. Opponents of Gatwick expansion claim the proposal would increase the problems of noise, air pollution and road congestion already suffered by surrounding communities. A bid to build a new second runway was rejected by the UK Government in favour of Heathrow expansion in December 2016. The airport says it could begin using its emergency runway for regular flights by the summer of 2025, just months before Heathrow’s third runway is due to open. The centre lines of Gatwick’s main and emergency runways are separated by 198 metres. The plan involves increasing the gap by widening the emergency runway by 12 metres. Its main runway would continue to be used for larger planes to take off and all aircraft to land but smaller aircraft such as the A321, A320 and B737 could take off from the emergency runway. The airport expects to spend up to £500million on the airfield works. Once opened, annual flight numbers are expected to increase from 281,000 today to as many as 390,000 in 2032-33, according to Gatwick’s figures. 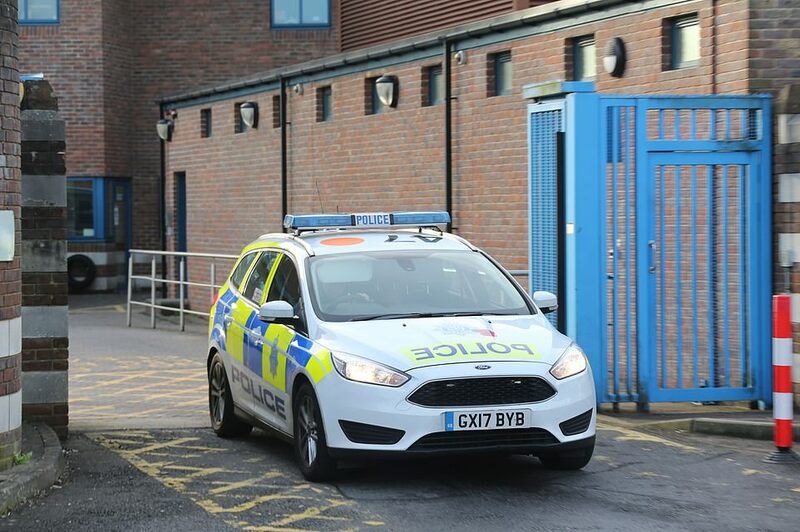 Sussex Police, whose officers patrol the airport, today revealed that Scotland Yard and officers from neighbouring Surrey Police have joined the manhunt. Steve Coulson, managing director of drone detection firm Coptrz, said it appeared to be a ‘targeted attack’ that could have originated abroad. He told the Times: ‘The operator may not even be in the country. You can have a secure internet link from China or Russia and control it remotely, just like we control drones remotely from Arizona and fly them over Afghanistan. 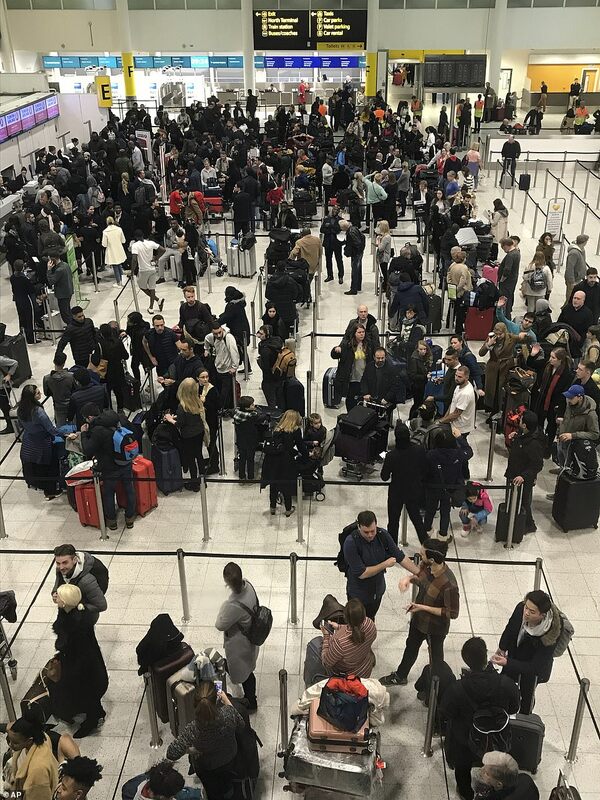 Some 350,000 people face having their Christmas plans ruined as disruption continued at Gatwick today. Drone expert Carys Kaiser told MailOnline: ‘It’s definitely not a hobbyist who’s thinking I’ll get some extra footage from a YouTube channel. ‘It is definitely something that is more organised in some capacity because obviously the drones that I fly and the drones that most people fly in the UK have this geofencing and we can’t get them to take off that close to an airport. Ms Kaiser added: ‘[The manufacturers] have all developed this software to ensure that people can’t just take a drone near an airport and take off. ‘You get lock zones, so you’ll get a yellow zone that could be a stately home or a football ground – it will say to you do you have permission, and you have to put in details and the manufacturer knows who it is, and if there was an incident they could trace it. ‘When you get an airport that’s a red zone, and you can’t unlock it unless you get written permission from an airport. You have to submit documentation, wait for five days and then you get an unlock code so you can fly. A former Army captain told The Sun that the attacker had showed ‘some serious capability’ and could be a ‘genius’ with a PhD. Richard Gill said: ‘Perhaps we are dealing with a person who just wants to do it to show how clever they are. No person or group has yet claimed responsibility for the sabotage, but officials are said to be working on the theory the saboteur could be an ‘eco-warrior’. A Whitehall source told the Daily Telegraph that an eco-protest was a ‘definite line of inquiry’. Environmental activist groups have previously targeted airports, in particular to protest the proposed expansion of Heathrow. When asked why someone would want to disrupt the airport, Transport Secretary Chris Grayling said: ‘There’s no sense of motive – there’s no suggestion that this is a terrorist act. ‘The counter-terrorist police have been very clear that they’ve seen no evidence that this is intended to be a terrorist act. 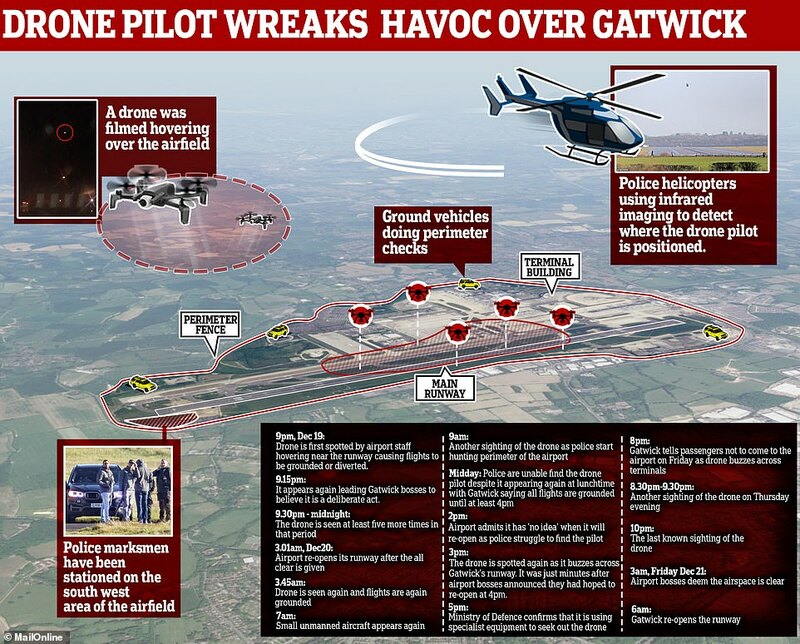 It’s clearly someone who wants to disrupt Gatwick Airport and there’s an intense police operation. 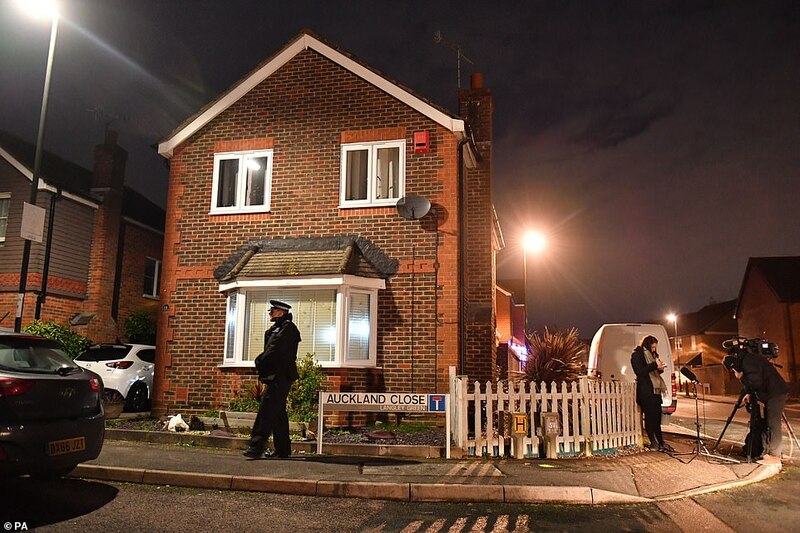 Sussex Police also said that ‘our assessment, based upon the information that we have available to us, is that this incident is not terrorism-related’. 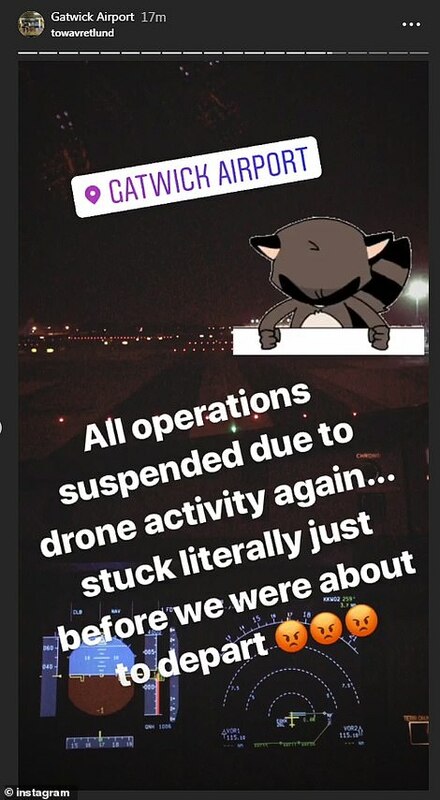 A couple due to be married tomorrow and their wedding party face further uncertainty at Gatwick Airport following severe flight disruption caused by drones. 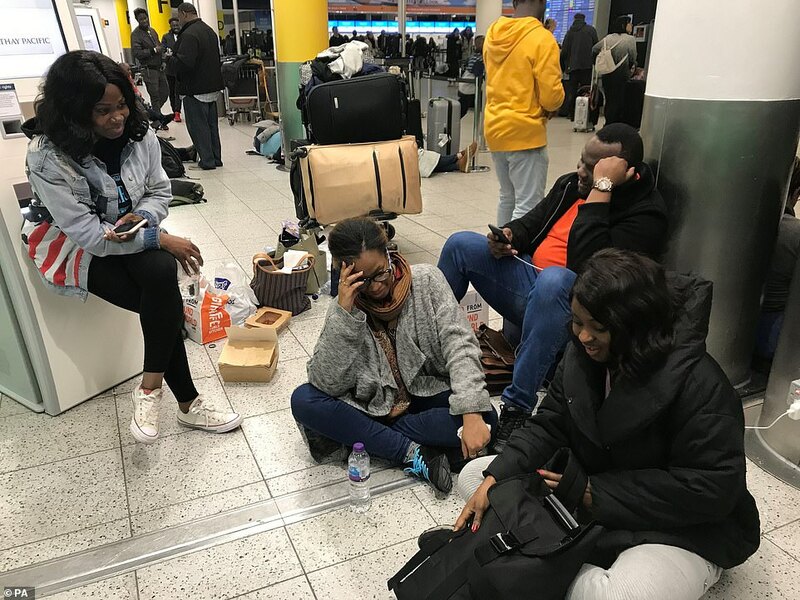 Bride-to-be Tayo Abraham and her partner Ope Odedine were due to fly to Marrakesh in Morocco on Wednesday alongside nine family and friends. The group boarded the Air Arabia flight, due to depart at 8.40pm, and were kept onboard ‘in the dark’ until 2am. 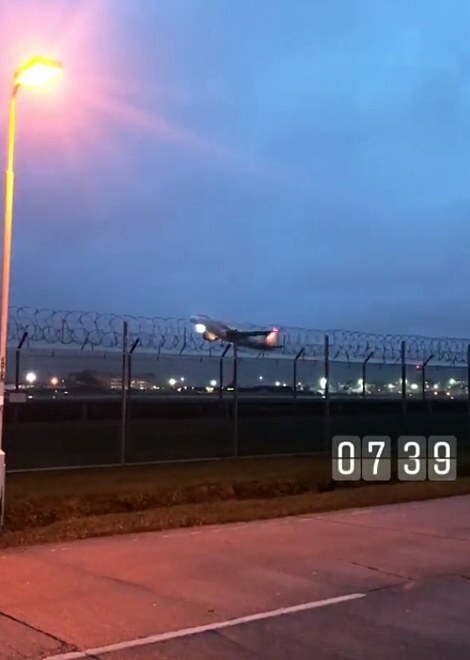 Gatwick’s runway only reopened at 6am today having been shut since Wednesday night due to devices flying over it, with chief executive officer Stewart Wingate saying they were designed to ‘close the airport and bring maximum disruption’. 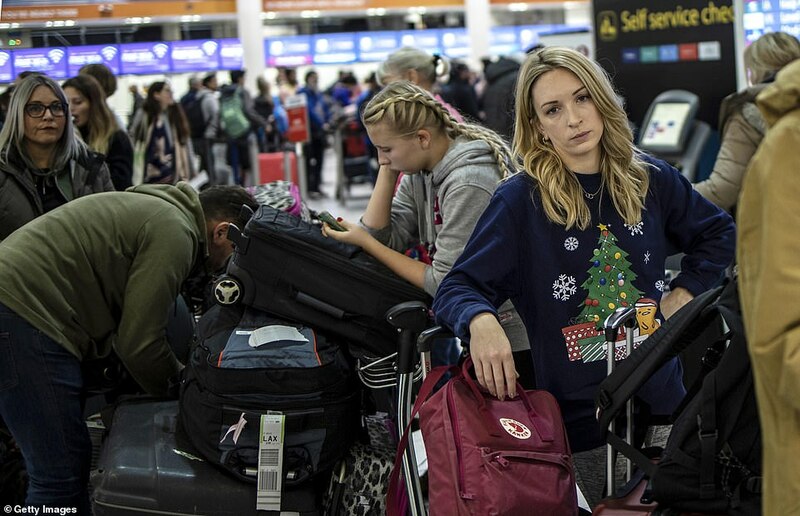 Thousands of families faced heartache as the chaos at Gatwick left holiday plans in ruins. Children wept as they learned their flights were cancelled, and plans for family reunions were abandoned, just days before Christmas. Some were left in limbo, waiting for hours at the packed airport to learn if their flights would finally go ahead. Tempers frayed as stranded passengers crammed into every available space, and berated airline staff for the lack of any updates. Miss Abraham, 31, a contractor from Glasgow, said: ‘It’s been a year that we’ve been planning this, we can’t start rearranging the wedding. 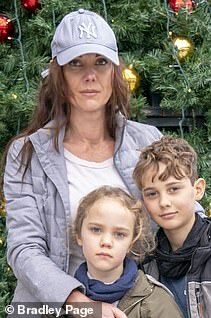 Finance director Natalie Carsey, 43, had saved up all year to take her children Patrick, nine, and Immy, seven, on a day trip to see Father Christmas in Lapland. Mrs Carsey, from Hertfordshire, said: ‘We had saved all year, and waited all year, for this. My daughter Immy has been crying since finding out. ‘I’ve been ringing around desperately trying to find another holiday but they’re all booked. The travel agents are going to try to give us a full refund but it’s very disappointing. ‘We’re heartbroken. Seeing Immy cry has made me tearful.’ Angry father Rob Threadgold was at the airport to take his two young sons on another ‘Santa flight’ to Lapland. 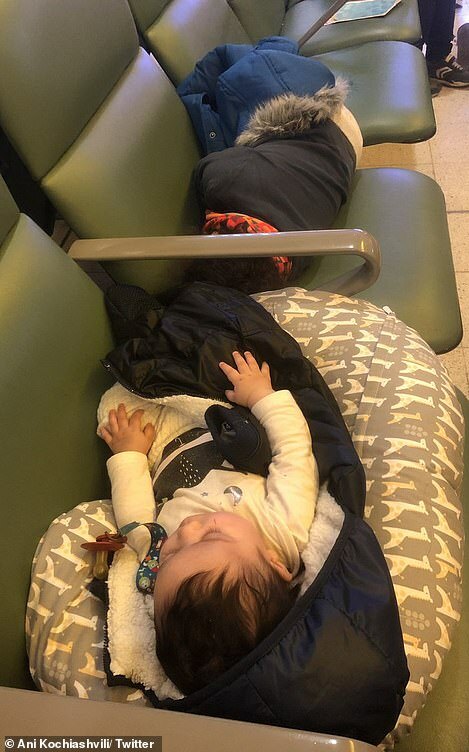 The group, including a four-year-old and a one-year-old, booked a hotel for the night after passengers were told to return to the airport at 11am yesterday. 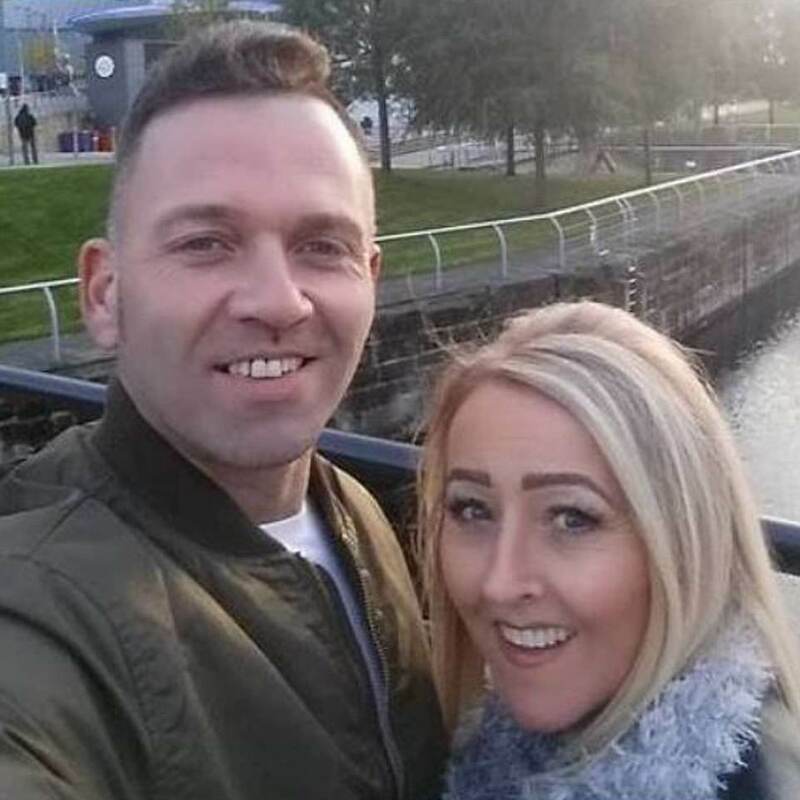 Following another day of disruption, Ms Abraham and her fiance then booked an alternative flight from Manchester Airport for this morning at a cost of over £1,000. She said they may have to ‘trim’ back on guests as the additional cost of rebooking flights was too high for everyone to pay. The couple are due to fly back on December 26, with other members due to return to the UK on Sunday. 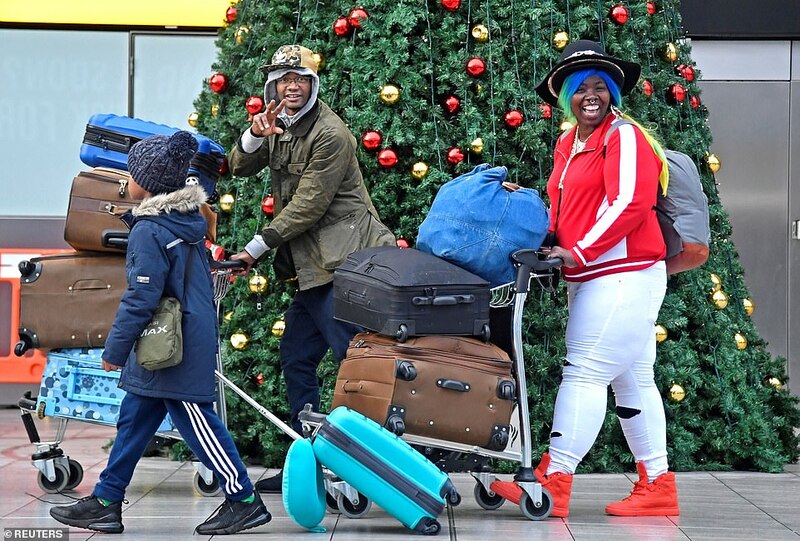 Ms Abraham’s uncle Baba Sanwo, from San Diego, flew into Heathrow from the US on Tuesday in anticipation of Wednesday’s flight, hoping to travel as a family. 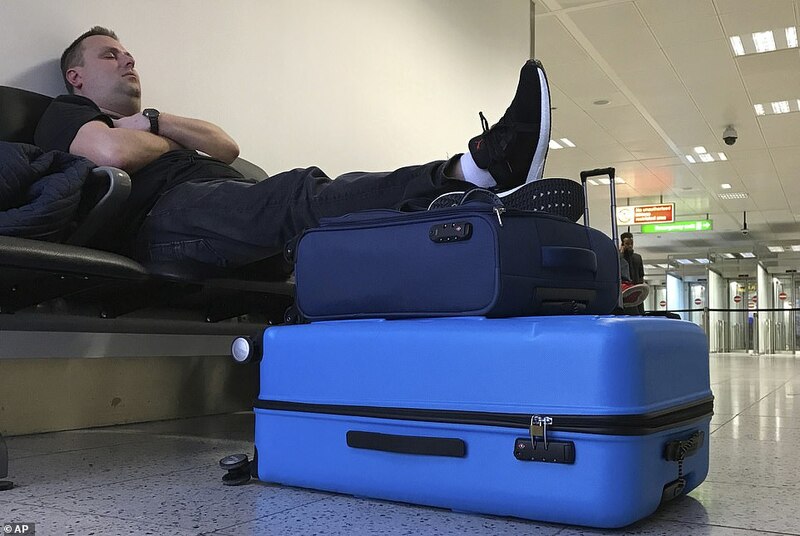 The 63-year-old said he had been sat on the floor of Gatwick for over five hours. Mother Liliana Cabrera broke down as she learned her flight to take her sons to visit their grandparents in Colombia had been cancelled. 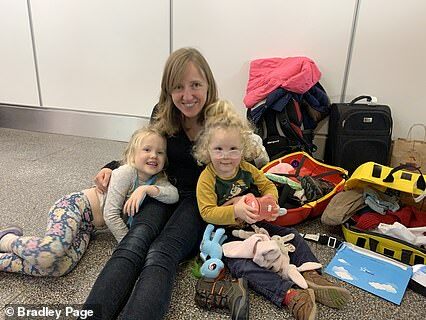 The 41-year-old had planned a three-week trip to Bogota with Isaac, six, and Leonardo, five, and had five suitcases filled with Christmas presents for her family. The museum worker from Greenwich, South East London, arrived at the airport at 3.45am only to find her 10am flight was cancelled. Another flight was announced for 2pm but when the family went to the gate, as directed, they were simply given their luggage back. ‘I don’t want to cry but we just wanted to see my family at Christmas,’ she said. The 41-year-old said the group paid £300 for the hotel on Wednesday and they are unsure whether they can recover the costs. Mrs Phillips said: ‘This kind of thing can be avoided. You’re saying you’re trying to prevent loss of life, but you know it’s a drone. 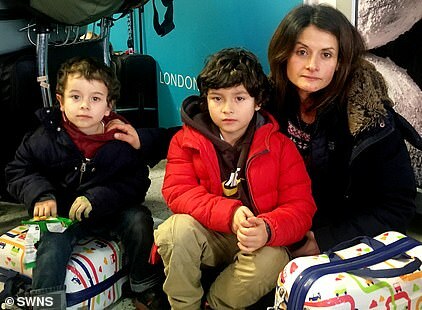 Meanwhile Gisele Fenech, 43, who was travelling to Malta, was among those stranded at the airport yesterday. 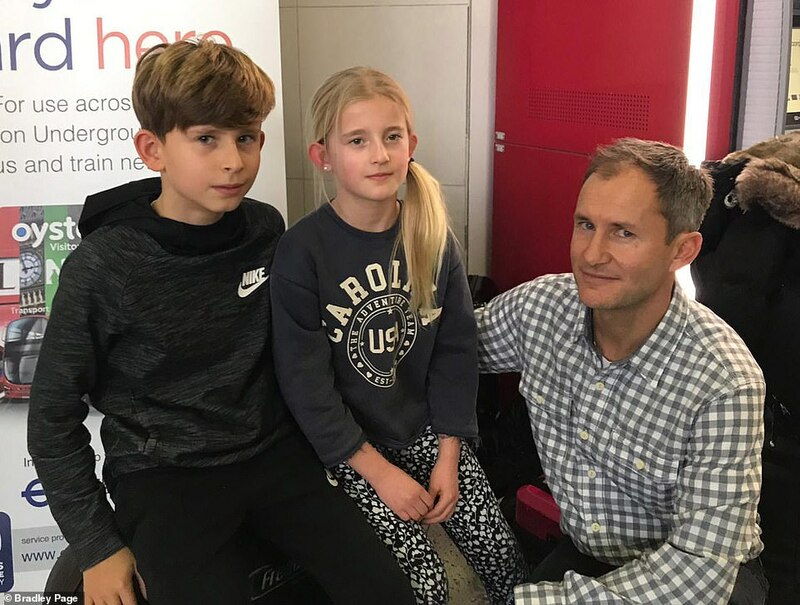 Meanwhile Andrew and Siv Ravenscroft were on their way to a Christmas family reunion in Norway with children Anders, 12, and nine-year-old Erica. 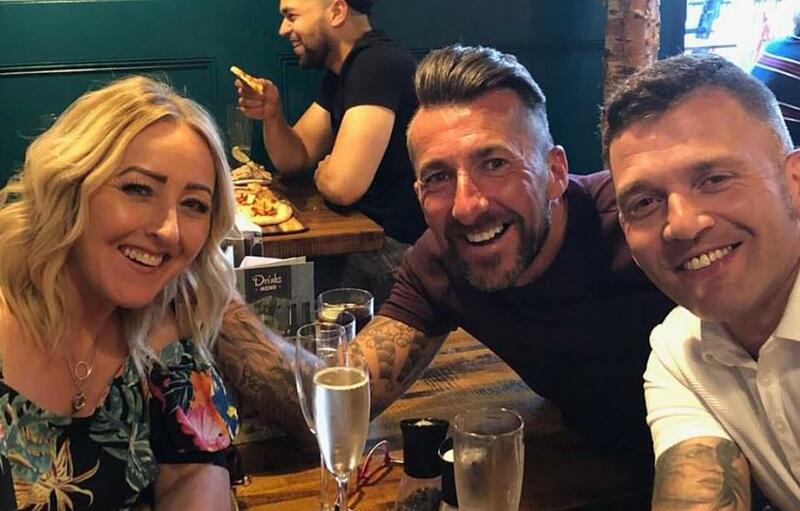 The family had flown from their home in Jersey to Gatwick on Wednesday night to catch a flight to Oslo, but their first flight was diverted to Stansted, where their plane was kept on the tarmac for three hours. They paid £180 for a taxi from Stansted to Gatwick, only to find that their next flight from Gatwick to Oslo had been cancelled. In desperation, the family spent another £1,000 for four tickets from Heathrow on a flight today. Mr Ravenscroft, 50, said: ‘When we landed at Stansted we were stuck on the tarmac for three hours. ‘People were shouting, saying they just wanted to get off. ‘We were told there would be three coaches to get us to Gatwick, but there was nothing. We had to pay £180 for a taxi. Mother Pam Noakes was waiting to take her young children to spend Christmas with their grandparents in Canada. 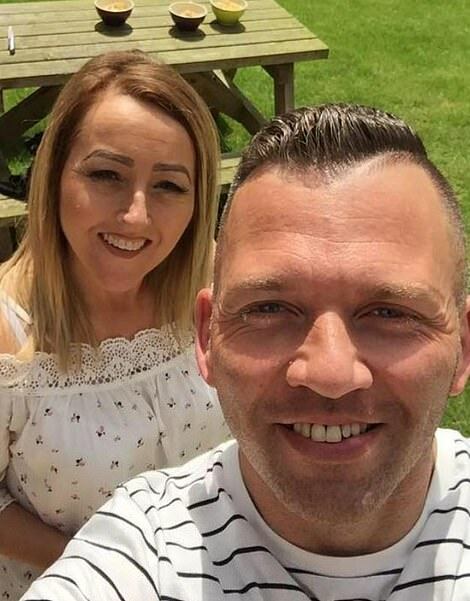 The mother-of-two was due to fly from Gatwick to Toronto, but was told at the airport that the flight would be leaving from Birmingham instead. Mrs Noakes, whose children are aged five and two, said: ‘They’re apparently putting on a coach to Birmingham. ‘We finally arrived at 3.30am for a 9am flight. They let us check our bags in so we thought we were travelling, then they called us to the gate and gave them back. 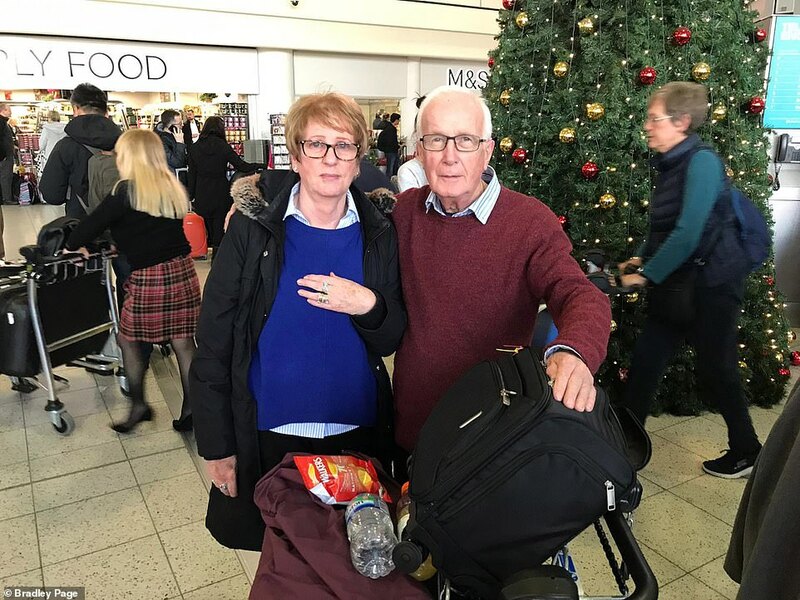 Pensioners Robert and Susan Pocknell were due to fly to Spain for Christmas. They arrived at Gatwick shortly before 4am but were greeted by scenes of chaos, and had to join a massive queue to try to change flights. 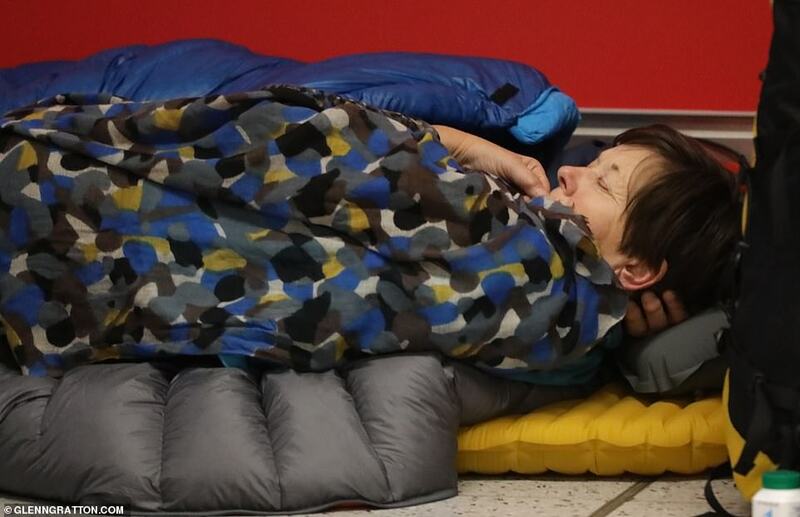 After queuing for almost four hours, the couple from Hillingdon, West London, had moved barely 20ft in the queue, which stretched around the south terminal. Mr Pocknell, 78, said: ‘Everybody was arguing. There was no organisation whatsoever. No one even showed us where this queue was, we had to find it ourselves. ‘We’re going on a package holiday so I’m worried if we don’t get to Malaga before Sunday we’ll lose our room and won’t have a hotel to stay in. I just want a refund and a new flight. 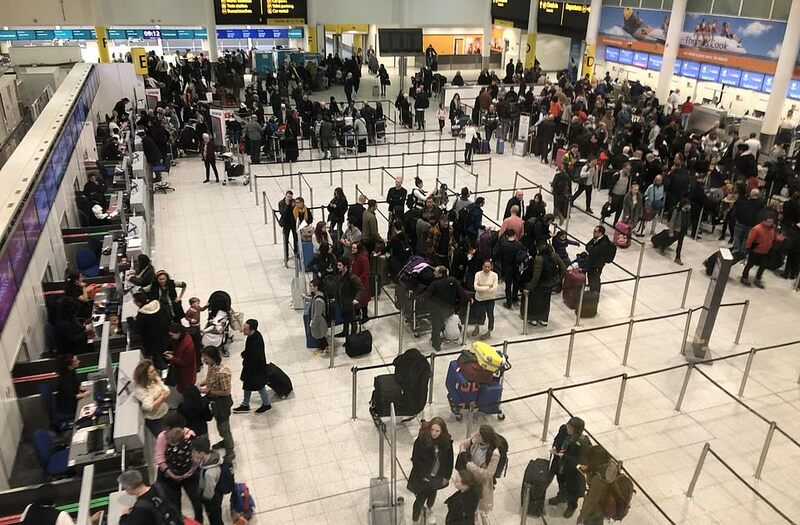 British air passengers stranded around the world are facing a scramble to get home for Christmas as the shockwaves from Gatwick’s drone chaos spread around the globe. 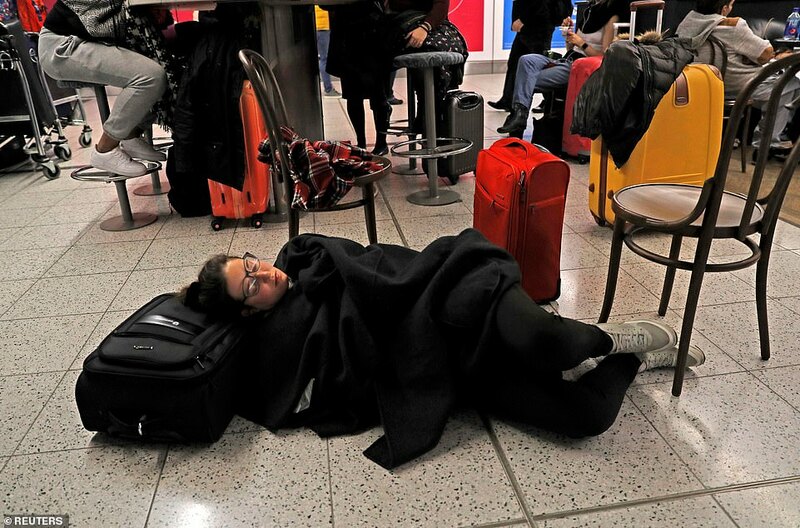 The closure of Britain’s second busiest airport for more than 30 hours yesterday due to a rogue drone pilot saw scores of flights cancelled and many passengers left in limbo after being diverted to other terminals in Europe. 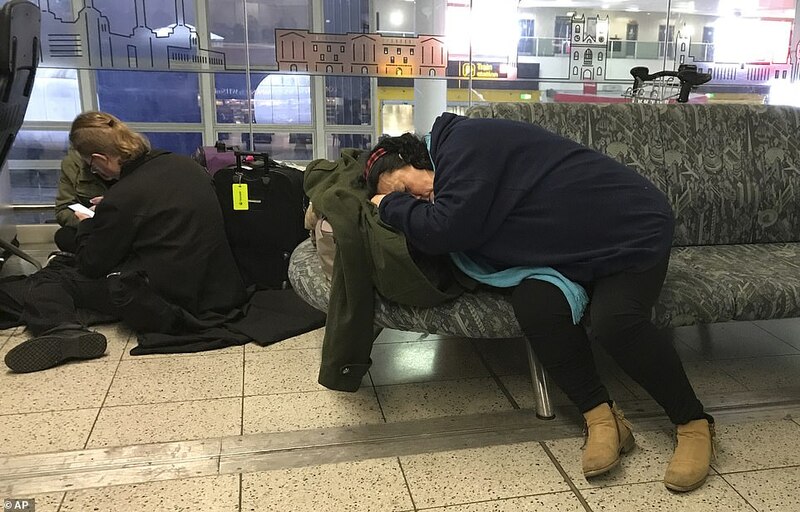 Those trapped in foreign airports spoke of being forced to sleep on floors and visa complications as the knock-on effects hit other terminals. 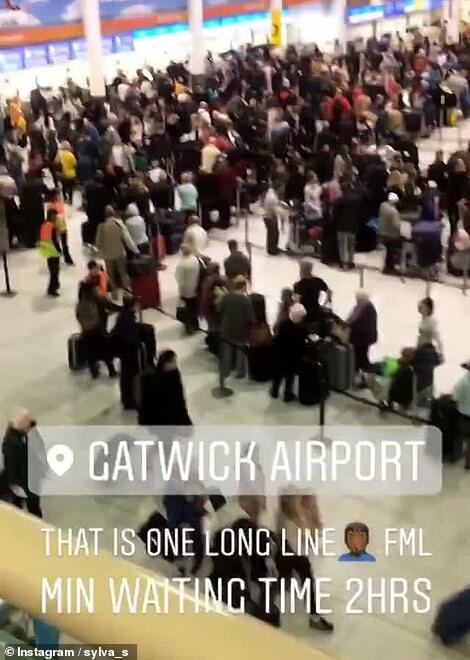 Worse still, the huge backlog of flights now waiting to fly into Gatwick means many people stuck abroad face a nervous wait to see if they’ll get home for the holidays. Many are having to fork out for alternative flights, often hopping around the globe in a bid to eventually return to Britain. 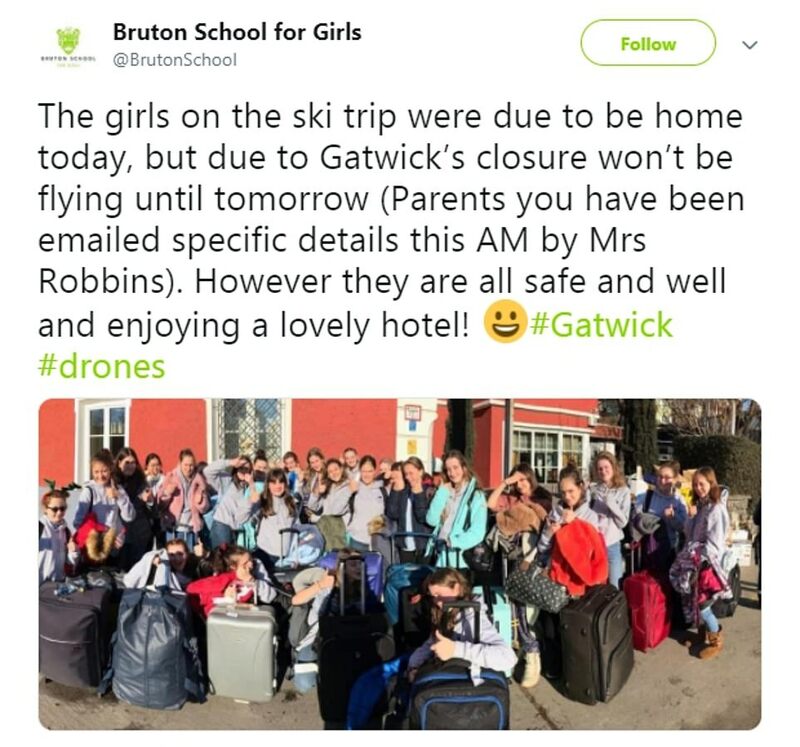 Among those stranded abroad are 27 schoolgirls from the Bruton School in Somerset. They were due to be back with their families last night, but had to stay on in Innsbruck, Austria following a ski trip. Teachers are hoping they can get on a flight today to return to their anxious parents. More than 120,000 passengers were unable to either take off or land at the airport from 9pm on Wednesday and throughout Thursday. 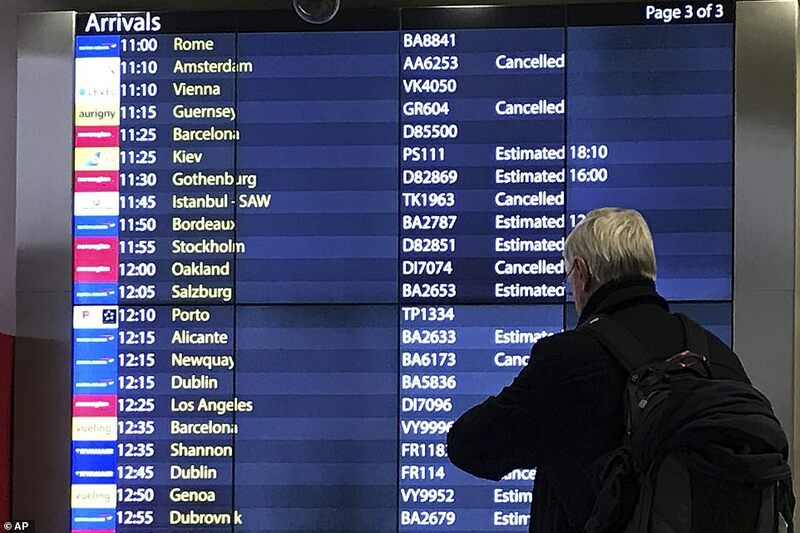 A further 126,000 passengers were due to travel today, but 145 out of the scheduled 837 flights have already been cancelled as aircraft are out of position and the airport’s operations are restricted to just a few departures and arrivals per hour. Holidaymakers who went on pre-Christmas breaks to the Caribbean face long delays in getting back. Some are now flying to New York, before transferring on flights to Europe and then getting Eurostar trains to London, with some journeys planned over three days. 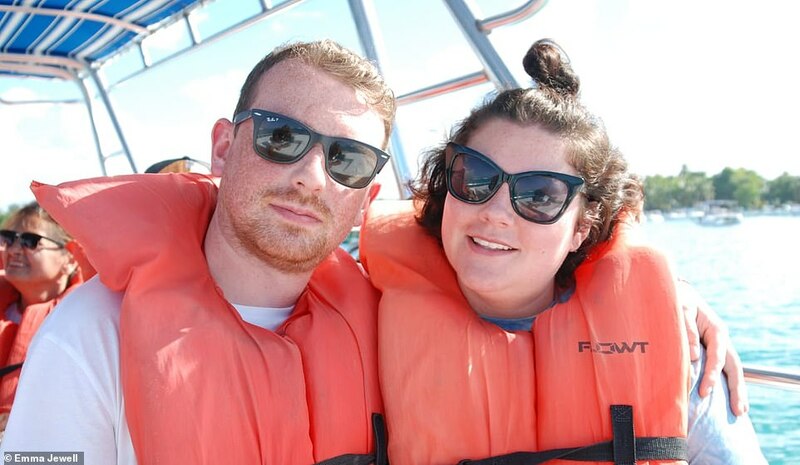 Jon Carles and his partner are stuck in Lanzarote. Speaking yesterday, he told MailOnline: ‘We were supposed to be to flying back to Gatwick today with EasyJet, but no one knows what’s going on here and what’s going to happen. 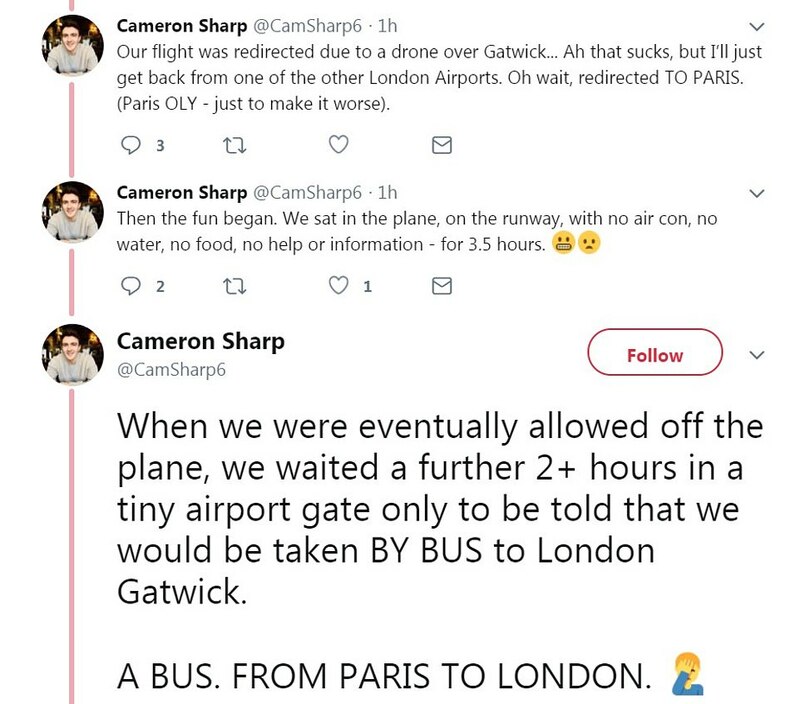 One flyer hoping to reach London had to land in Paris – where he was told that he’d be diverted back to the UK on a bus. Others paid for hotels in the French capital out of their own pockets after failing to get information from their airlines. 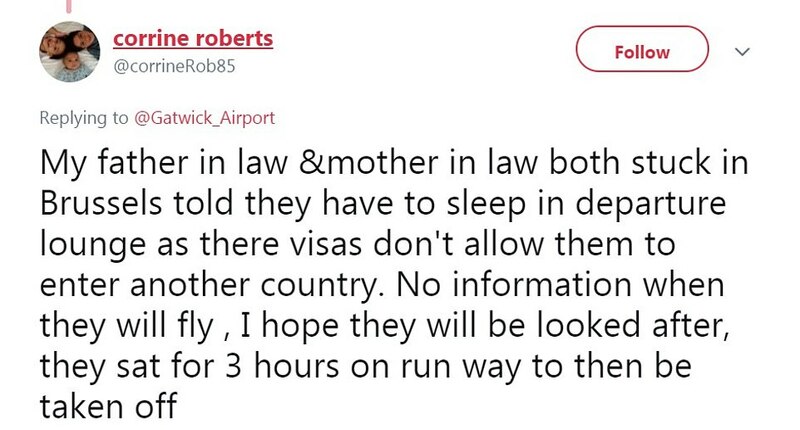 Corinne Roberts said that her parents-in-law were stuck in a departure lounge in Brussels as their visa don’t allow them to enter the country beyond that point. 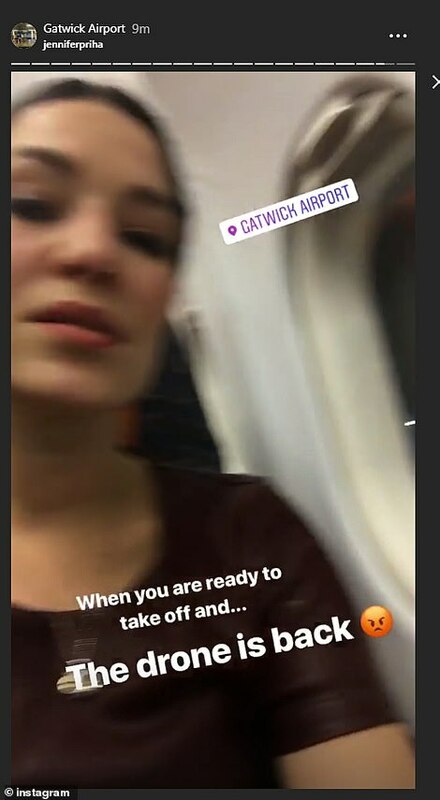 Joseph Ouechen, a photographer from Morocco, was due to fly into Gatwick on Wednesday night but had his flight diverted to Paris. After arriving at Charles de Gaulle Airport at midnight, passengers with visas for the Schengen area were taken to a hotel but those without – ‘about 20 per cent’ – were left in the airport to fend for themselves, he said. Firefighters eventually crossed the border through passport control with blankets and water at 3.30am, he said. ‘To be honest, I’m so tired and when the guys from the fire (service) came with the bottles and blankets I was feeling like a war, like (I was) a refugee, but I’m just flying to the UK. Those who didn’t find themselves stuck abroad had to land more than 100 miles from their destination once they made their way back to the UK. 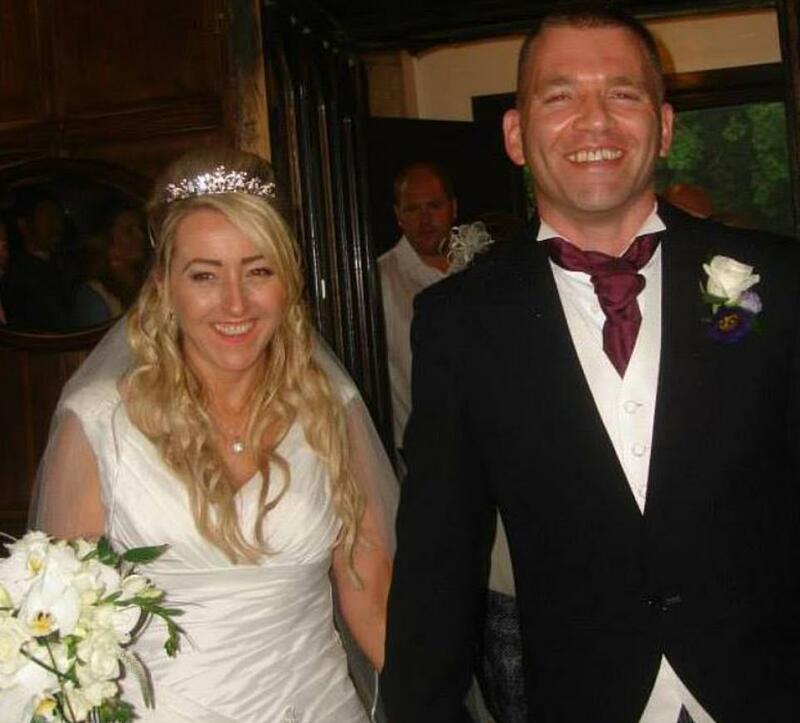 Chris Lister, from Somerset, who owns an online business, was travelling back from Kiev with his wife Freya. He was due to land at Gatwick at 9.45pm yesterday but ended up trapped on the plane on the tarmac at Birmingham Airport until 6am. ‘There were quite a few babies and kids on board, I think they were struggling more than we were and one woman had run out milk,’ he said. After starting his journey in Bangkok on Tuesday he was finally let off the plane at 6am, he said. Gareth Jones praised easyJet’s response to the chaos, telling MailOnline: ‘My son was due to fly home from Salzburg this morning on an Easyjet flight that was obviously cancelled. ‘They have transferred him to the same flight tomorrow and put him up in a four-star hotel, with meals, overnight. 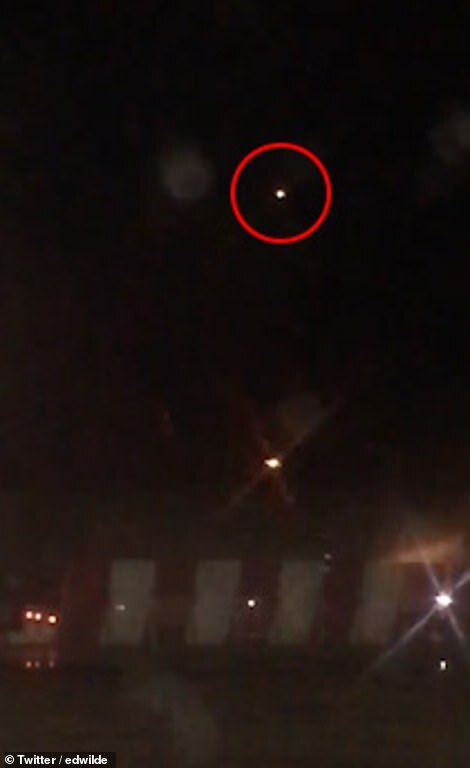 Sally Gardiner, who is in Nice, France, said: ‘The problems caused by this malicious person extend way beyond Gatwick. My son was to join me in Nice today for a break before Christmas. ‘I don’t see him very often so my disappointment is immense. ‘I have also paid in advance for his accommodation. 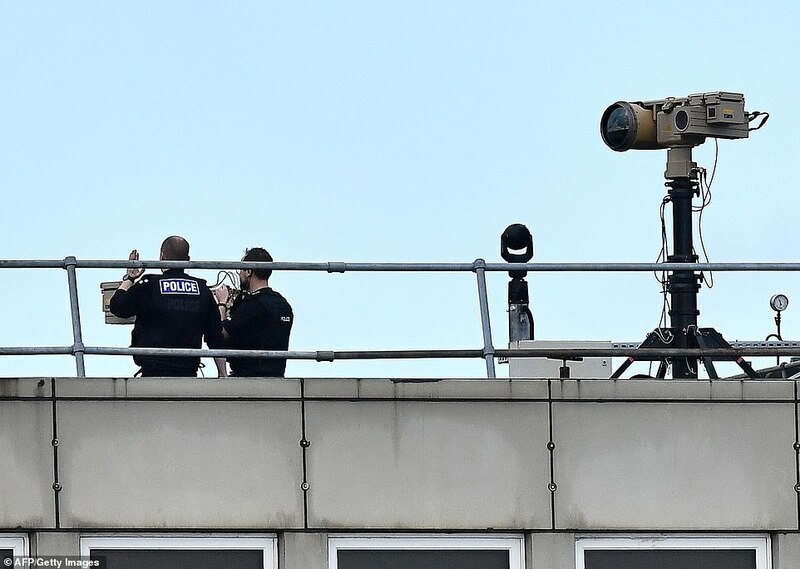 Killer lasers, high-tech jammers or tracking the signal: How the police could destroy the Gatwick drone of misery… so why haven’t they already? 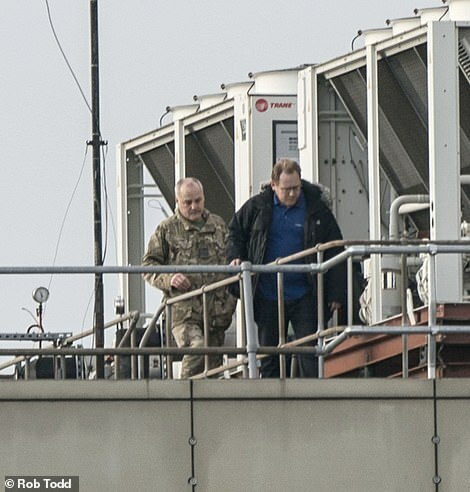 The criminal who is illegally flying a drone at Gatwick Airport is being hunted by police and military personnel using cutting-edge technology. Gatwick has been brought to a standstill in the wake of the rogue drone terrorising the airport. Several methods have been developed including laser-laden drones, high-tech jammers and tracking the signal via triangulation which may be used to end the fiasco. 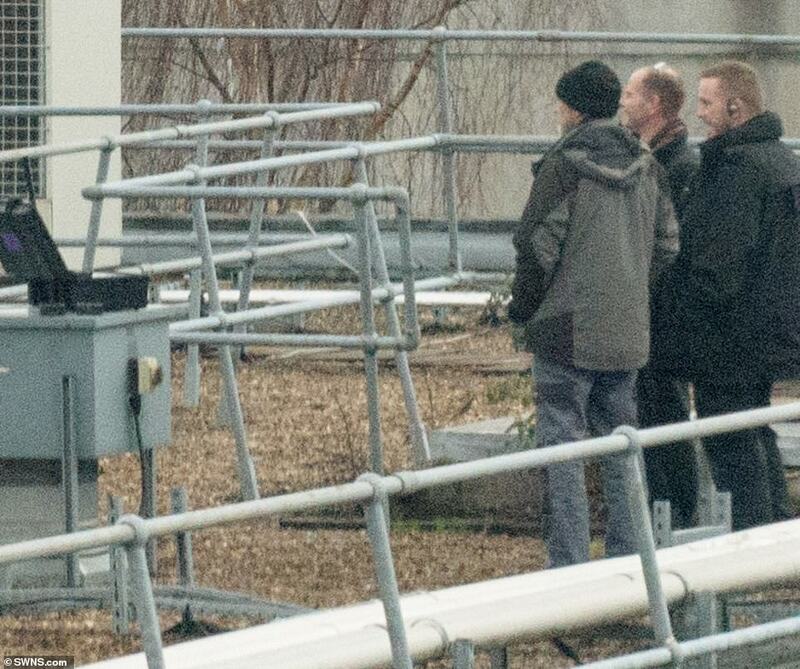 Human snipers have also been brought in to help with the pursuit of the drone. The Army has been working on a ‘Drone Dome’ or ‘kill-jammer’ – which can ‘soft kill’ a drone by knocking out its communications or a ‘hard kill’ by shooting it down with a laser from up to two miles away – and may use this prototypical technology. It remains unknown when the debacle will end and normal service will be resumed and how the drone fiasco will be drawn to a close. Frequency jammers and early warning systems are common near US runways but are seldom employed in the UK. 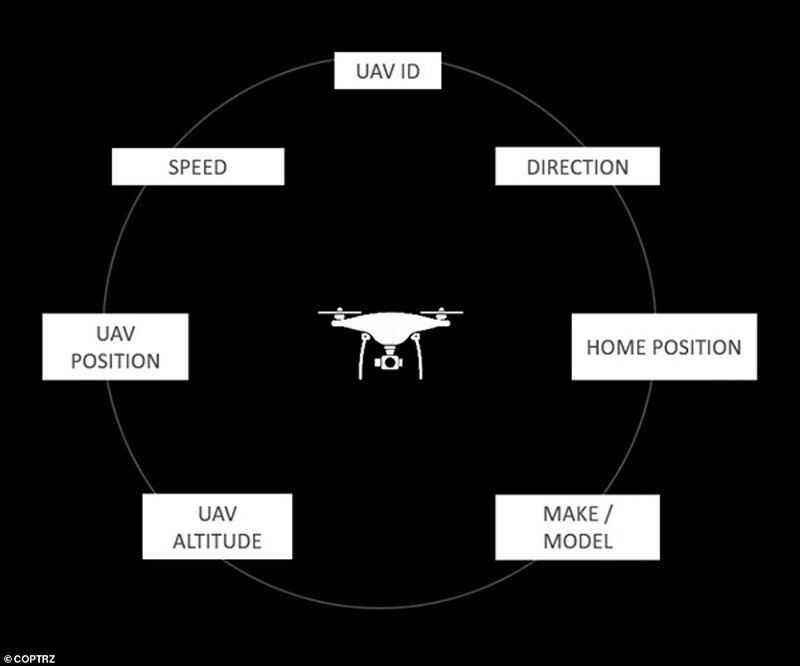 Communication between the drone and the operator can also be used to pinpoint its location through triangulation, in a similar way to mobile phone tracking. Is it possible to stop drones from flying in restricted areas? Drones are a problem not only for airports – but also for prisons, where attempts have been made to send everything from phones to drugs. The law on drones – or UAVs (unmanned aerial vehicles) – has been tightened in recent years but Jon Parker, managing director of UK drone training company Flyby Technology, says rules are irrelevant to bad actors. ‘They will always get through. This isn’t something that rules can help with because it doesn’t matter what the rules were today, they’ve just broken those rules,’ he explained. Geofencing is used by most off-the-shelf commercial drones, which creates a software bubble around restricted areas that block aircraft from entering, but not all drone-makers include the feature and anyone building their own machine can exclude it. Jamming is another option, which the US Federal Aviation Authority and China’s Guangzhou Baiyun International Airport have already tested, but Mr Parker says the technique has its setbacks, notably because many drones use the same control link signal as WiFi networks. Tokyo has resorted to a police drone squad to patrol important buildings and capture nuisance drones. Aside from technological assistance, eagles and falcons have been explored as a possible solution for rogue drones, though the results were not as successful as hoped. In 2016, Dutch police began training eagles to hunt out drones, but a year later the programme was pulled as birds were apparently not always doing what they were trained to do and because of the cost. Police are having difficulty locating the operator as the drone disappears when they close in with via triangulation. The process requires constant connection and if it is lost, so is the location of the perpetrator. 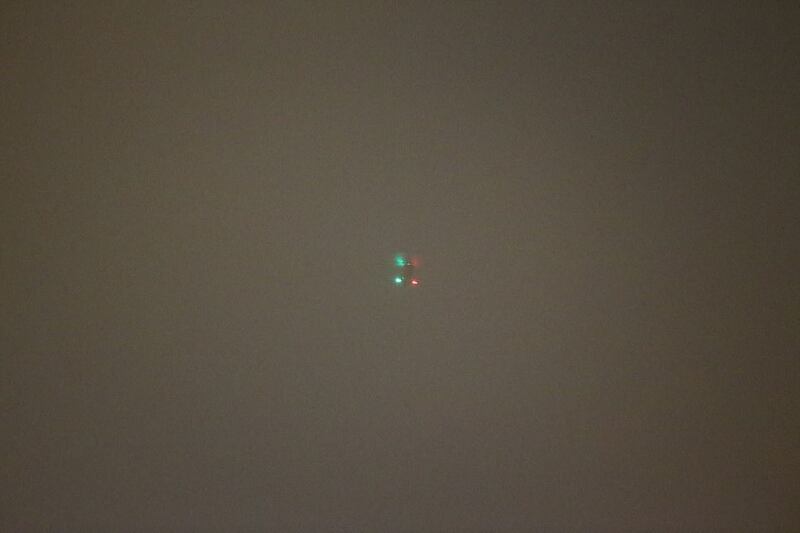 As the drone disappears the signal vanishes and police are then unable to narrow down the location of the suspect. Radio transmitters operate with a specific frequency range, one that has been set aside for RC car/aircraft use. If the drone is recovered, it should be a formality for the authorities to successfully identify the other component. Physical methods of destroying the troublesome drone focus around two main ideas; a physical destruction of the device and a communications block which will see the drone lose contact with its controller and drop out the sky. 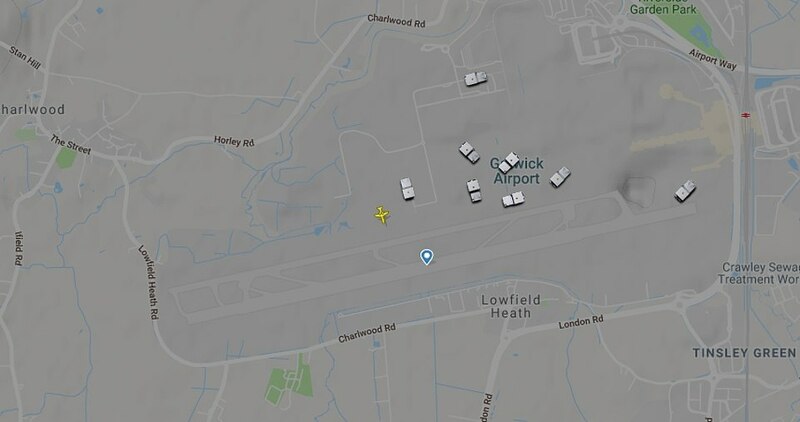 In May, London Southend Airport tested an anti-drone system which uses a combination of radio frequency and optical sensors to detect nearby drones. The week-long trial using Metis Aerospace’s Skyperion product saw test drones flown within a 2.5-mile (4km) radius of the airport in Essex – 40 miles away from London – for the two sensors to pick up, and it was said to have been a success. In August, it was revealed that the British Army had bought an Israeli anti-drone system, which will be used to protect sensitive facilities in the UK. The Multi-Mission Hemispheric Radars technology by Rada Electronic Industrials is said to provide 360-degree surveillance and be able to detect drones 3.5km (2.2 miles) away. The Drone Dome, in which the technology is embedded, can disable an airborne drone in two seconds from its five kilowatt ‘hard kill laser effector’. Meanwhile a system developed by three British companies which is capable of jamming signals on unmanned aerial vehicle was trialled in its first public test by the US Federal Aviation Authority in June 2016. 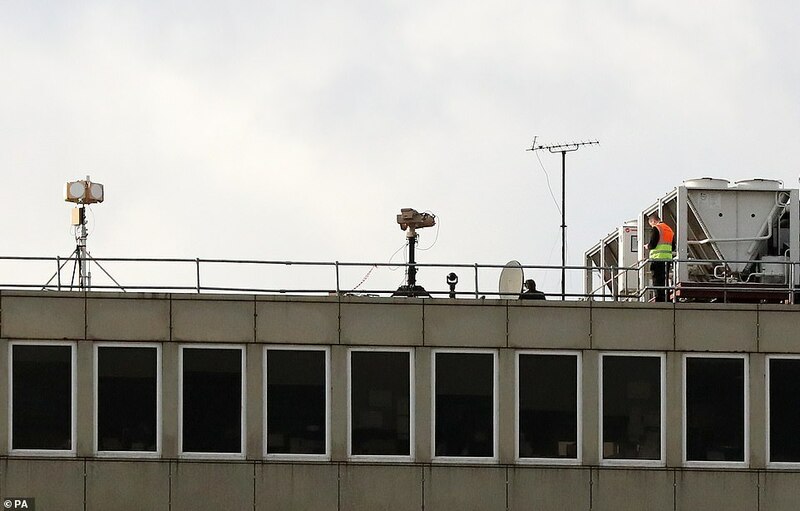 The Anti-UAV Defense System (Auds) system – built by Enterprise, Chess Systems and Blighter – uses high powered radio waves to disable drones, effectively blocking their communication and switching them off in mid-air. More recently in November 2017, a ‘detective early warning system’ and ‘drone interference system’ against unmanned aerial vehicles was trialled at Guangzhou Baiyun Airport in China, which has also faced issues with drones near airports. 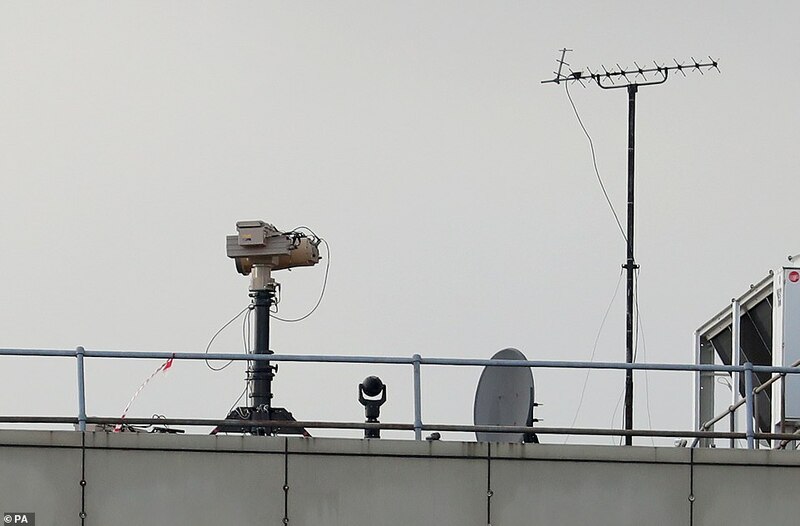 The Cangqin system – which can work in all weather conditions – can monitor a low-altitude airspace five miles (8km) in diameter, and locate a drone three seconds after it becomes operative within the supervised range. Earlier this year, China demonstrated the capability of its drone-killing lasers have successfully destroyed an unmanned aerial vehicle (UAV) from 1,000 feet (300 metres) away. Back in Britain, research funded by the Department for Transport (DfT) found that a drone weighing 400g (14oz) could smash a helicopter windscreen, and one weighing 2kg (4lbs) could critically damage an airliner’s windscreen.